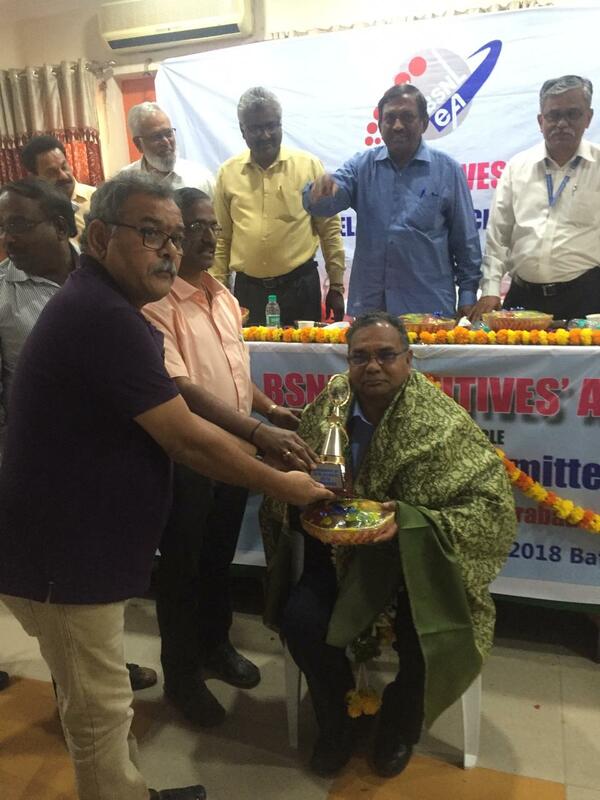 The 3rd AIC of AIRBSNLEWA: The 3rd AIC of All India Retired BSNL Executives' Welfare Association (AIRBSNLEWA) will also be held on 17th April, 2019 at 10.00 Hrs (For One Day) at the same venue. The boarding and lodging arrangements for The CHQ office bearers /Advisors / Consultants /Circle Secretaries / Circle Presidents / CWC Members will be from 12th July, 2019 to 17th July, 2019 and for the delegates have been made from 13th July, 2019 to 17th July, 2019. (a) DE to DGM Promotion: We requested Director(HR), BSNL Board for early issuance of the DE to DGM promotion order on Adhoc basis. We explained to Director (HR) about the next TBP to DEs/ DGM(Adhoc ) under EPP from E5 to E6 grade, which is due in Oct 2019. It will not be extended to these executives if regular promotion ordered in DGM grade in view of BSNL MSRR 2009 provisions. Most of the Executives are stagnated in E5 grade .To avoid heavy financial loss to these executives in pay as well as pensionary benefits , We requested to consider Adhoc promotion now and regular promotion in the Grade of DGM after Nov 2019. 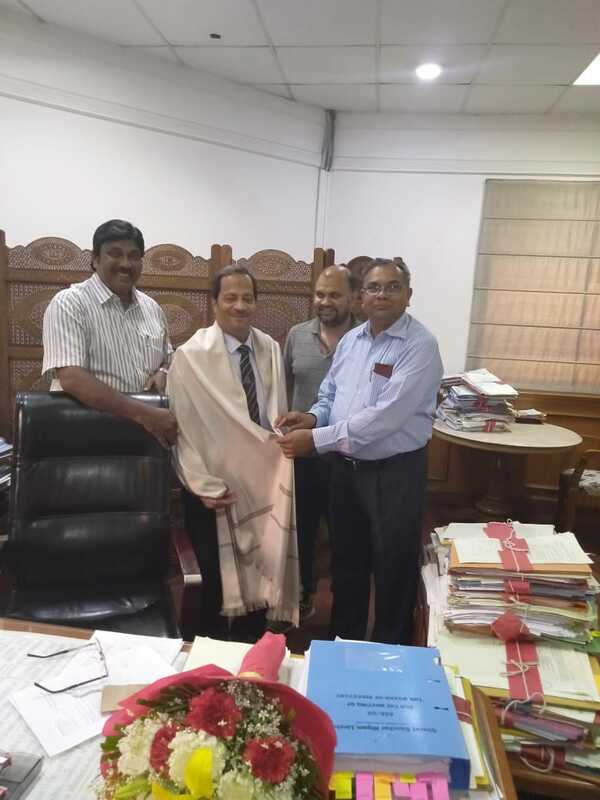 In this regard we handed over our latter dated 23.04.2019 with relevant documents to Director (HR) for consideration. After detailed discussion Director (HR) directed PGM (Pers.) to examine the matter in the light of EPP and BSNL MSRR provisions and to take decision in the manner where the executives are not put in loss. PGM(Pers.) assured to look into the matter and apprised that the VCRs and APARs of the eligible executives for DGM Promotions have been called from circles. He further mentioned that efforts are being made to issue DE to DGM promotion order by the end of this month. 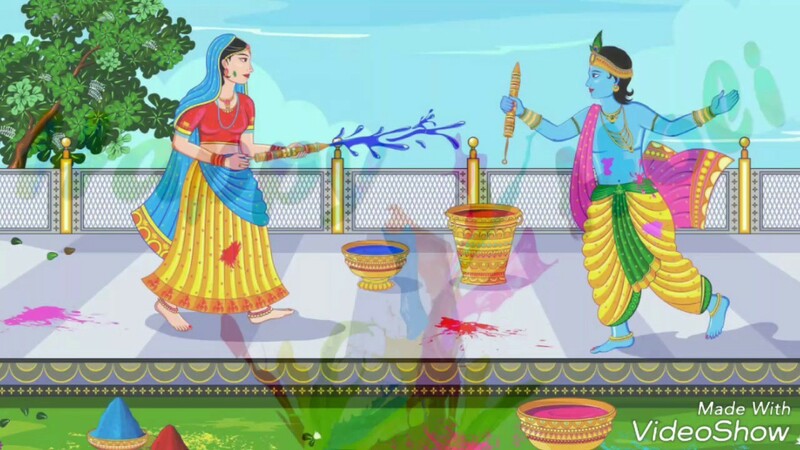 (b) Diversion of 50% MT quota CAO posts to the seniority quota: Director(HR), BSNL Board informed that the proposal for the diversion of 50% MT quota CAO posts (#336) to the seniority quota was included in the agenda of BSNL Board Meeting held on 16.04.2019 but due to incomplete quorum, the matter could not be discussed. Thus the matter was deferred for next Board Meeting . (c) CAO to DGM(F) Adhoc promotion: we requested to consider CAO to DGM(F) Adhoc promotion for the eligible executives. PGM (Pers.) informed that the case is under process. (a) DE to DGM Promotion: We requested PGM(Pers. ), BSNL Co for early issuance of the DE to DGM promotion order on Adhoc basis. We explained to PGM (Pers.) about the next TBP to DEs/ DGM(Adhoc ) under EPP from E5 to E6 grade, which is due in Oct 2019. It will not be extended to these executives if regular promotion ordered in DGM grade in view of BSNL MSRR 2009 provisions and clarification issued by Pers. cell on 11th June 2018. Most of the Executives are stagnated in E5 grade. To avoid heavy financial loss to these executives in pay as well as pensionary benefits, We requested to consider Adhoc promotion now and regular promotion in the Grade of DGM after Nov 2019. After detailed discussion PGM (Pers.) got convinced but advised us to discuss the matter with Director (HR) for necessary instructions in this regard. (b) Consideration of request / tenure transfers of SDEs / DEs / DGMs : We requested for the consideration of pending request / tenure transfers of SDEs / DEs / DGMs. PGM(Pers.) mentioned that all the pending applications and stay particulars of tenure stations are being examined in Pers. cell and shortly the genuine request / tenure transfer order will be issued . All Circle/District Secretaries of AIBSNLEA are requested to put more efforts to collect more funds as assured in CWC Dehradun in connection with 6th AIC to be conducted at Vijayawada on 14th, 15th & 16th of July-2019. In addition to three days conference, Pre- AIC CWC meet on 13th July-2019 and CHQ office bearers meeting on 12th July-2019 are to be conducted for which more fund are required. So, all are requested to extend their full support by sending the Souvenir Collections / Contributions to the 6th AIC Bank Account opened in the Union Bank of India Governor Pet Vijayawada branch. The Account Number : 346401010068673. IFSC code : UBIN0534641. The email id for sending Circle wise delegates information is 6aicaibsnlea@gmail.com and akrao1959@gmail.com. 15.04.2019: Meeting with CMD BSNL: GS met CMD BSNL & discussed regarding revival plan of BSNL being taken up by DoT in the Cabinet Meeting for consideration. CMD BSNL mentioned that Govt. is serious towards revival of BSNL and BSNL has to continue in the telecom sector. (b) DE to DGM Promotion: We requested CMD BSNL for issuance of promotion order from DE to DGM(T). CMD BSNL assured to discuss the matter with Director(HR), BSNL Board for early issuance of the promotion order from DE to DGM. (c) Non Settlement of the pension fixation of BSNL pensioners by the CCA Kolkata: We requested CMD BSNL for his kind intervention in the settlement of pension fixation cases of Kolkata by CCA. CMD assured to discuss the matter with Director(HR), BSNL Board and to write to DoT for the settlement of the cases. (a) DE to DGM Promotion: We requested Director(HR), BSNL Board for early issuance of the DE to DGM promotion order on Adhoc basis. Director(HR), BSNL Board mentioned that the CPC work from DE to DGM promotion is advance stage & shortly VCRs are being called for the eligible DEs for promotion. She further assured for issuance of promotion order by the end of April, 2019. (b) Diversion of 50% MT quota CAO posts to the seniority quota: Director(HR), BSNL Board informed that the proposal for the diversion of 50% MT quota CAO posts (#336) to the seniority quota has been included in the agenda of BSNL Board Meeting to be held on tomorrow (i.e. 16th April, 2019). We extended thanks for the kind consideration. (a) DE to DGM Promotion: We requested PGM(Pers.) to issue promotion order from DE to DGM on Adhoc basis. PGM(Pers.) mentioned that the CPC is being conducted from DE to DGM(T) promotion on regular basis to fill up more that 1100 DGM(T) posts. He further clarified that existing DGM(Adhoc) will also be promoted on regular basis in addition to the new promotions so that these DGM(T) promoted on regular basis can look after the charge of Jt. GM/GM field units. We explained that most of the DEs being promoted as DGM are due for their time bound promotion in E-6 grade in Oct-2019 may be deprived from E-6 promotions on DGM Regular promotion as per BSNL MSRR provisions. PGM(Pers.) assured to look into the matter before taking the approval from Competent Authority. (b) Diversion of 50% MT quota CAO posts to the seniority quota: PGM(Pers.) confirmed that the matter of MT post diversion in CAO cadre has been included in the BSNL Board Meeting to be held tomorrow(16th April, 2019). The VRS has been recommended of 50 years above age employees on the existing pay only. 3rd PRC pay fixation in VRS is not under consideration. Director (HR). BSNL Board invited the Representatives of BSNLEU, NFTE, AIBSNLEA & BSNLOA for a meeting in view of the proposed Demonstration call given on 12.4.2019 against VRS in the presence of GM(SR), GM (Restrg) & OSD to Dir (HR) and apprised regarding the Revival Plan of PMO discussed in the presence of Group of Secretaries, CMD BSNL & CMD MTNL. Wherein after discussions direction was given to DoT to give the proposal on BSNL Revival mainly on three points i.e., 4 G Spectrum Allocation, Monetization of BSNL Lands and VRS. Accordingly DoT/BSNL has prepared the Cabinet Note to put up in the next Cabinet Meeting. This item may not be discussed in the Cabinet Meeting scheduled to be held on 12th April 2019 in view of that the Secretary (T) is on tour to abroad. 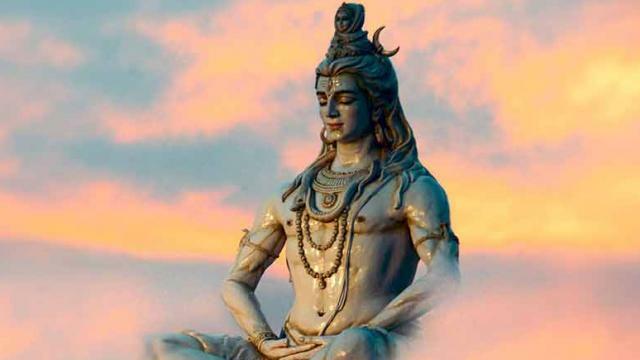 10.04.2019: Why AIBSNLEA is opposing VRS? f. Denial of 1st Time bound Promotion under EPP after 5 years by Pr CCA Kolkata : we expressed our serious concern against the denial of 1st Time bound Promotion under EPP after 5 years by Pr.CCA Kolkata despite the direction/ clarification by DOT Kolkata Pr. CCA. denial of 1st Time bound Promotion under EPP after 5 years by Pr. CCA Kolkata. Advisor (Finance ) mentioned that after our last meeting the necessary instructions from DOT HQ were issued to Pr CCA Kolkata for settling all the cases of BSNL pensioners under EPP provisions in true spirit . He assured to provide the copy of the letter given to Pr CCA by DOT in the next week to us. 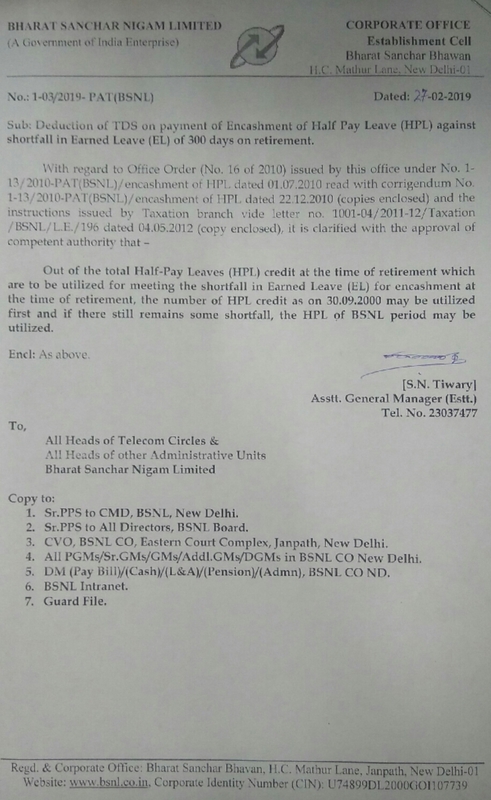 Pension revision of BSNL Retirees: We requested DDG(Esrtt.) for sending reply to DOP&PW letter dated 08.03.2019 (<<<Click here for letter>>>) regarding revision of pension of the absorbed combined service pensioners of BSNL/MTNL from 01.01.2017. DDG (Estt.) Mentioned that the pension related file is under submission to Secretary (T) Office on some queries and on returning the file ,the DOP&PW letter for reply will be submitted to the competent authority for approval. He also mentioned that DOP&PW has not replied the query made by DOT that whether pension revision can be delinked from pay revision of BSNL serving employees . (a) DE to DGM Promotion: We requested PGM(Pers), BSNL CO to issue promotion orders from DE to DGM at the earliest since VCRs are expiring this week. PGM(Pers) mentioned that the CPC work from DE to DGM(T) is in progress and efforts are being made to issue promotion order shortly . (b)Adhoc DGM (T) / DGM (F) regularization: We requested PGM (Pers.) for the regularization of Adhoc DGM (T) / DGM(F) so that they can look after the higher vacant posts in the SSAs. PGM (Pers.) assured an early action in this regard. (c) Diversion of Internal MT quota of CAO posts to seniority quota: We requested PGM(Pers.) to consider diversion of 50% MT Internal quota of CAO posts numbering 336 posts in the BSNL Board meeting scheduled to be held on 4th April, 2019. PGM (Pers) mentioned that due to paucity of time this item can not be included in the BSNL Board meeting being held tomorrow. However, efforts will be made to bring this issue in the next BSNL Board meeting by delinking from HR plan. (d) Allowing looking after arrangement from DE to DGM(T) after one year where the DGM promotion was declined : We requested to issue instruction to AP Circle for allowing looking after arrangement from DE to DGM to the DEs who declined their DGM promotion in the last CPC and have completed more than 1 year. PGM Pers spoke over telephone with GM (HR) AP circle and clarified the ruling position in this regard to give look after arrangements and advised him that they can seek clarification from BSNL CO. if required. (a) Representation from Shri Jagdish Chandra Chouhan, DGM (F) Staff No. 89065 regarding grant of upgradation in IDA scale E-6 and promotion of Jt. GM (Finance). (c) Representation from Shri P.K. Tailor, AGM Staff No. 37563 regarding his name in the provisional sequence list/provisional seniority list of eligible DGM on Adhoc basis. (a) Representation from Shri J.P. Prajapat, CAO Retired HR No. 19750588 regarding relaxation in 2 weeks mandatory training for IDA up gradation in E-5 scale of pay. 01.04.2019: Sh. N.K. 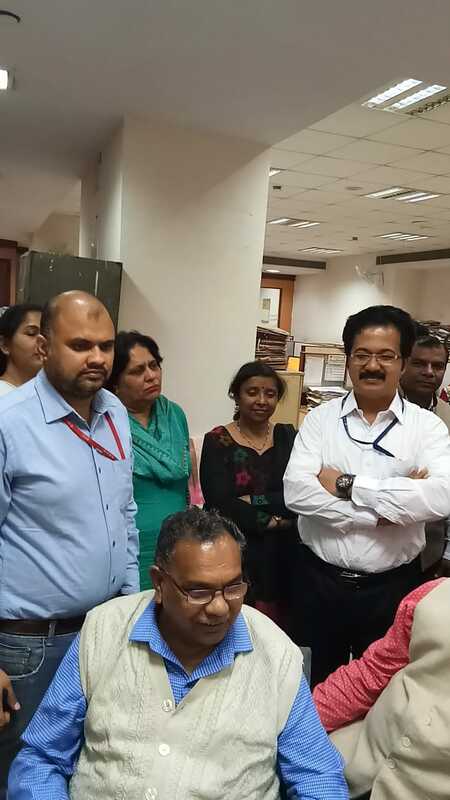 Mehta, Director(EB), BSNL Board retired on his superannuation on 31st, March, 2019. 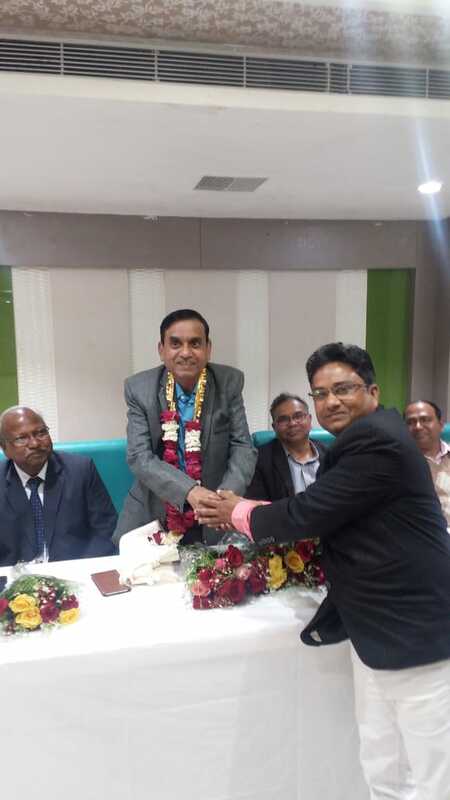 AIBSNLEA greeted & felicitated him on his retirement on superannuation on 30th March, 2019. Alongwith other Circles mainly surrounding Circles i.e. Haryana, Punjab, UP(West), Rajasthan & ALTTC Ghaziabad of AIBSNLEA Circle Secretaries are requested to take urgent steps for mobilising maximum number of our members for participation in the Massive March to the Sanchar Bhawan, to be held on 05.04.2019 as per the call given by AUAB. 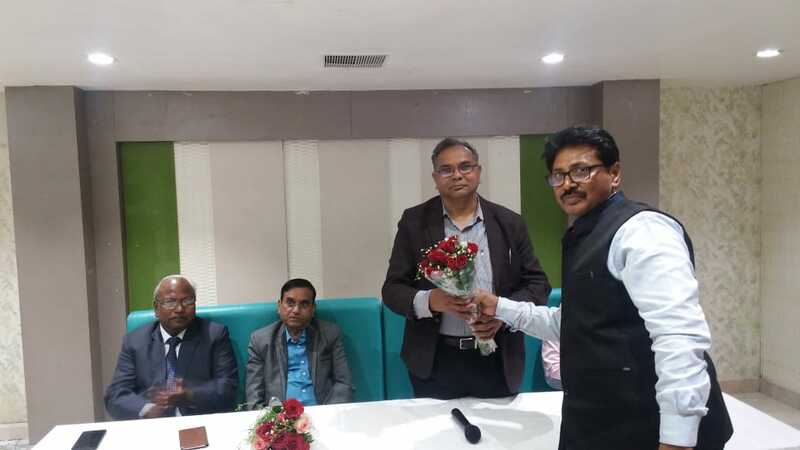 A meeting between the representatives of the AUAB and Shri Anupam Shrivastava, CMD BSNL, was held today the 28.03.2019. Ms. Sujata T. Ray, Director (HR) was also present. Com. 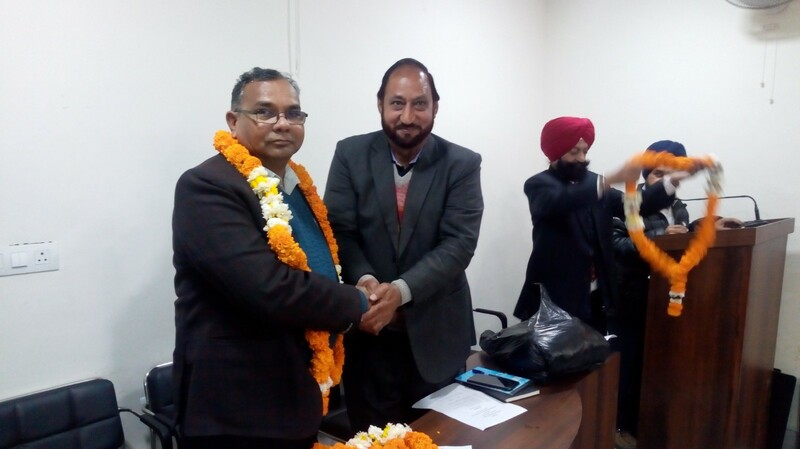 P. Abhimanyu, Convenor, AUAB, Com.Chandeswar Singh, Chairman, AUAB, Com.K. Sebastin, GS, SNEA, Com. Prahlad Rai, GS, AIBSNLEA, Com. Pathak, AGS, AIGETOA, Com. Suresh Kumar, GS, BSNL MS, Com. Rewati Prasad, BSNL ATM and Com.Kabeer Das, GS, BSNL OA, participated in the meeting. The following issues were discussed. (1) Imposition of break-in-service under FR 17 A: The AUAB has already written to the CMD BSNL, stating that break-in-service under FR 17 A, cannot be imposed on BSNL employees, since it is not part of the CDA rules. In today’s meeting, the representatives of AUAB insisted for expeditious action by the Management, on this issue. The CMD BSNL and the Director (HR) assured to do the needful. (2) Wrong calculation in the wage cut: The representatives of the AUAB pointed out that the wage cut, for participation in the 3 day strike, has been done based on wrong calculation. That is, the three day wages has been arrived, by taking 28 days as a month’s salary. Instead, a month’s salary should be calculated as 30 days. As a result, more money has been deducted from the salary of the employees. Further, three days wage cut should be calculated on basic pay and DA only. But in many places, this calculation has been done wrongly. The CMD BSNL and Director (HR) assured to do the needful on this. (3) March to Sanchar Bhawan - provoking instruction given by the BSNL Corporate Office: The SR Branch of the BSNL CO., has sent an instruction to the CGMs, directing that the principle of ‘no work no pay’ should be implemented on those employees who take part in the March to Sanchar Bhawan. It was pointed out by the AUAB representatives that, as per rules, the principle of ‘no work no pay’ cannot be imposed on employees for their participation in the rallies. Responding to this, the Director (HR) said that, she was not aware of any such instruction having been issued by the Corporate Office, and assured to look into it. The CMD BSNL informed the representatives of the AUAB that, the March salary will be paid to the employees on time and he also told that this payment of salary is being made purely from BSNL’s own earnings. GS & President CHQ AIBSNLEA attended the meeting. (a) Invitation to inaugurate 6th AIC at Vijaywara : We requested CMD BSNL to inaugurate 6th AIC of AIBSNLEA as Chief Guest on 14th July 2019 at Vijaywara along with Dir(HR) Smt Sujata Ray as Guest of honor. CMD BSNL and Director (HR) accepted our invitation to inaugurate 6th AIC at Vijaywara. (b) DE to DGM Promotion: We requested CMD BSNL to consider DE to DGM(Engg.) promotions to fill-up 891 vacant DGM posts since CPC has been completed 3 months before and the VCRs are expiring in the first week of April-2019.CMD assured to discuss the matter with Director (HR) for an early action. (c) Diversion of MT Internal Quota Posts: We requested CMD BSNL to take the approval of BSNL Board for the diversion of 50% MT internal quota posts numbering 336 CAO posts to the seniority quota posts since the Management Committee of BSNL Board has already recommended the diversion of these 336 CAO(MT Posts). CMD BSNL assured to look into the matter. 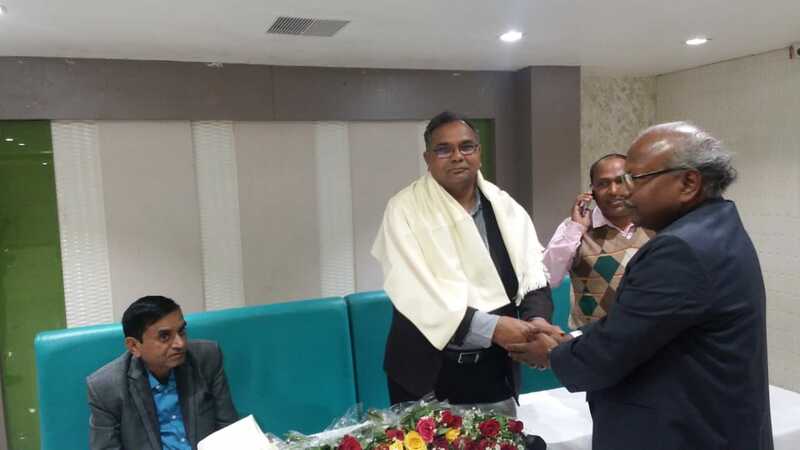 28.03.2019: Meeting with Director (HR). 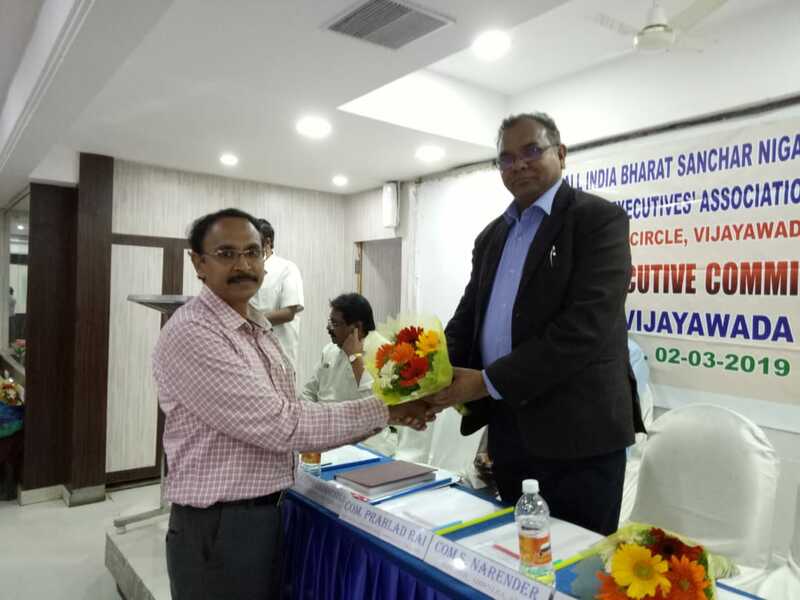 BSNL Board: GS & President and AGS(Finance) met Director (HR) BSNL Board and invited to attend inaugurate session of 6th AIC at Vijaywara on 14th July 2019 as Guest of Honor. Director(HR) assured to attend the conference. PGM(Pers.) and OSD were also present in the meeting. (a) DE to DGM promotion: We requested to issue DE to DGM (Engg.) promotion orders at the earliest as the VCRs are expiring in the first week of April-2019. PGM(Pers.) mentioned that DE seniority list is being examined and promotion orders may be issued in the 2-3 week of April-2019. (b) Diversion of MT Internal Quota Posts: We requested Director(HR) BSNL Board to take the approval of BSNL Board for the diversion of 50% MT internal quota posts numbering 336 CAO posts to the seniority quota posts since the Management Committee of BSNL Board has already recommended the diversion of these 336 CAO(MT Posts). Director(HR) BSNL Board further directed PGM(Pers.) to put up the matter in the next BSNL Board meeting scheduled to be held on 4th April-2019. (b) Utilization of 336 MT CAO internal Quota Posts: We requested for consideration of further promotion in the cadre of CAO by Utilizing 336 MT CAO internal Quota Posts which was already recommended by the Management Committee to the BSNL Board. Director (HR) immediately directed PGM (Pers) to process the case for approval in the next Board Meeting being held on 4th April 2019. 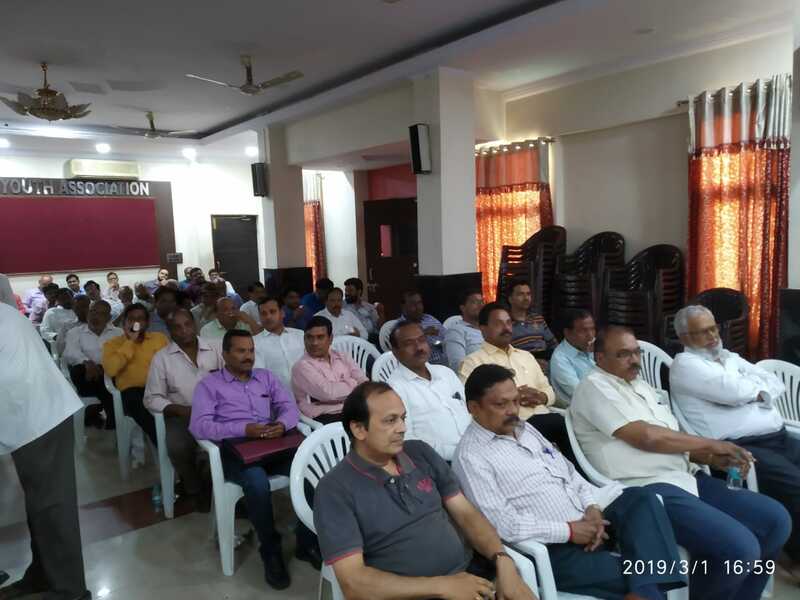 An open session was held during the First Circle Executive Committee meeting of the AIBSNLEA Maharashtra Circle on 22.03.2019 at 11.30 hours in the Digambar Jain Auditorium, Kolhapur. Hon'ble Member of Parliament Shri Yuvaraj Sambhijiraje Chatrapati was the Chief Guest. Com. Prahlad Rai, GS AIBSNLEA CHQ, Com. K.P. Nair, AGS (GD), Com. C.M. Saste, OS(W), CHQ, Shri V G Patil, DGM (CFA), Kolhapur were present besides Circle Secretary Com. A G Joshi, Circle President Com Rajesh Parulekar, Circle Financial Secretary Com. Kokate. CEC was inaugurated by the dignitaries on the dias by lighting the lamp. Function started with Saraswati Vandan. Daughter of Shri Sasi, JAO, Pune has performed wonderful dance programme. All the members on the dias were welcomed and felicitated. District level Leaders of SNEA, BSNLEU, NFTE, SEWA, FNTO and office bearers of retired association were also present, felicitated and addressed the gathering. Com. A G Joshi, Circle Secretary welcomed one and all and briefed about the circumstances under which BSNL is passing through. 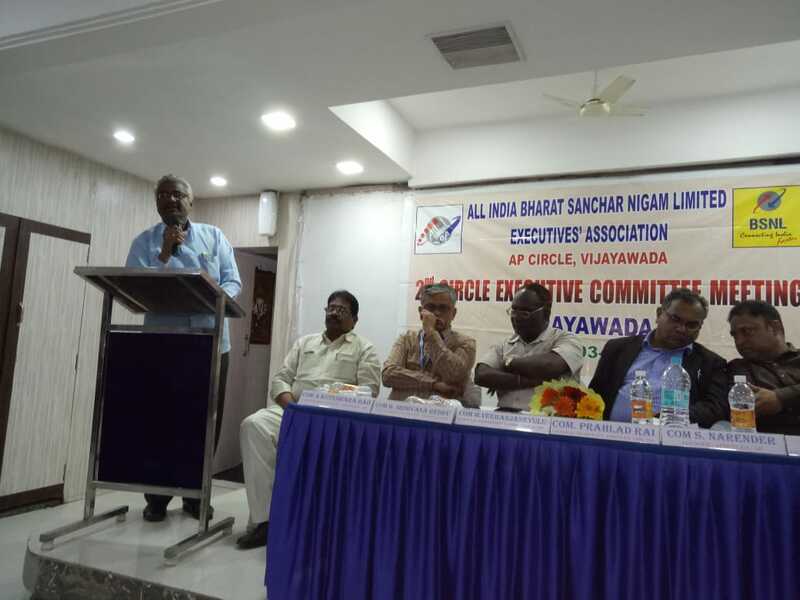 He urged one and all to be united in the crucial time and work hard to improve the financial position of the BSNL and also to support the CHQ of AUAB in fulfilling the proposed actions of AUAB for not only improving the BSNL financial condition also in order to achieve all the demands of the workers. He extended all the support of entire Maharashtra Circle to GS AIBSNLEA and requested to go ahead with the activities He also requested Hon. M.P. Shri Yuvaraj Sambhijiraje Chatrapati ji to support BSNL for its revival. Com. Prahlad Rai, GS AIBSNLEA briefed about the present financial condition of the BSNL, reason and circumstances led to the present situation. Com. Prahlad Rai in his address mentioned that at the time of formation of BSNL 3.5 lakhs employees got absorbed in BSNL and these employees got 43000 crores profit in the earlier year. Com Rai mentioned that the policies of the DoT / Govt. of India has led to the present circumstances of the BSNL. DoT has assured the rural deficit charges against the rural services provided by the BSNL with 34000 exchanges, and DoT has stopped the payment of rural deficit charges based on the recommendation of the TRAI, whereas BSNL continued with its services in rural areas without the refund of rural deficit charges. BSNL employees has reduced loss to half at 4000 crores in 2015-16 and made operative profit in the year 2014-15. However, after the introduction of Reliance Jio with 8 months free services has affected the revenue due to price war. Com. G S mentioned that the call drop in BSNL is much less as compared to any other service provider. The request of BSNL management to allot 4G spectrum one and half year back but it has not been considered by the DoT till date . The issue of allotment of 4G spectrum was raised many time in the Parliament and MoC has also assured to allot the 4G spectrum. Inspite of BSNL installing 4G equipment and awaited for the allotment of 4G spectrum, the request has not been considered by the DoT. This has also resulted in the revenue loss of BSNL, as BSNL has failed to meet the 4G demand of the customer, as against the 4G services provided by other service providers. GS further mentioned that when all the operators are availing loans from the Banks, BSNL is not allowed to avail the loan facility and the request of BSNL to issue letter of comfort to avail the loan is also not considered. This has also affected the revenue position of the BSNL has BSNL could is unable to compete with other services providers due to the negative approach of the beaurocrats in the DoT. He mentioned that first time in the history of DoT/BSNL, wages of the employees were not paid in time and the salary of the employees for the month of February 2019 was paid on 16.3.2019. He also pointed out that the pension contribution is being collected by the DoT on the maximum of the pay scale as against the decision of the Govt. of India to collect it on the minimum of the basic. This has also adversely affected the financial position of the BSNL. GS further stated that DoT has collected huge amount in excess from the BSNL on allotment of 3G by allotting the same at the highest rate by not allowing BSNL to participate in the bid. DoT has forcefully allotted the 3G spectrum to BSNL without giving any option to choose the circles. This has also affected / contributed to the present financial position of BSNL. GS further stated that as against the release of 2500 crores to BSNL, DoT has paid only 500 crores. 40% of the employees are involved in carrying out the NOFN project of the Govt. of India. He mentioned that BSNL is carrying out all the important project of the Govt. of India, Military services are also being met by the BSNL. At every occasion, BSNL is only reaching the public during the crisis of natural calamity. He pointed out that it is mandatory for the Govt. of allow BSNL to remain in service to protect the interest of the nation, security of the nation and to protect the larger interest of the public. He informed that once the BSNL is not in the service sector, private operators will increase the tariff rate as per their whims and fans which is adversely affect the customers. He demanded that BSNL employees are eligible for pay revision with 15% fitment at par with the other Govt. departments, as it was the need of the Govt. to form the BSNL from DoT. The demand of the employees are very well justified. 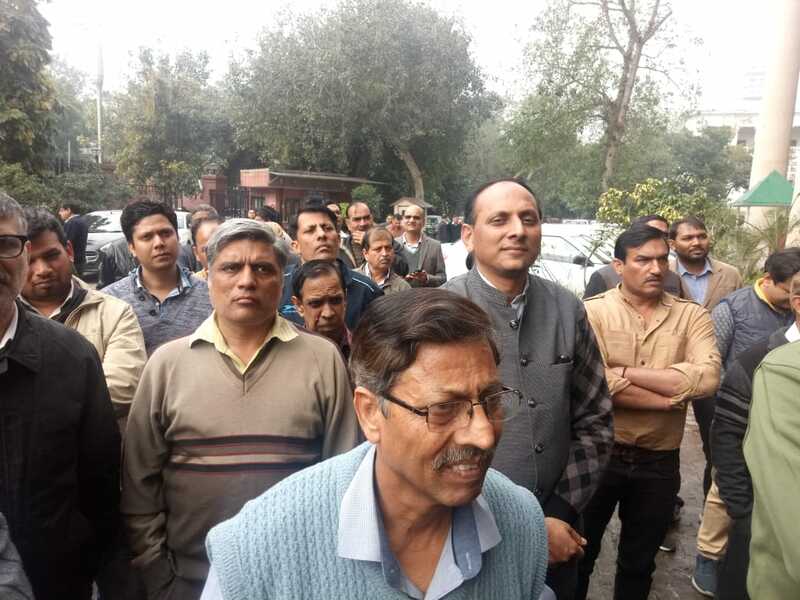 He also demanded that the pension revision of the retired officers and staff is the need of the hour, as the pension revision of all the staff and officers worked in the DoT has already been revised and that of the BSNL is not revised due to the reason that pay scale of BSNL employees has not been revised. He mentioned that there was no such condition at the time of formation of BSNL and pay revision of the BSNL employees are no way connected with the pension revision of the retired employees, as the pension of all other employees retired from all other department has already been revised. Revision of pension is no way related to the profit and loss of the BSNL, as the retired employees are not contributing anything for the growth of the BSNL and they are no way responsible for the financial position of the BSNL and such stand of the DoT is irrelevant and not justified. He has requested Hon. M.P. to use his good offices in resolving the issue by fulfilling the commitment given by the DoT at the time of formation of BSNL and also the assurances given by the MoSC to the AUAB representatives in the meetings held on 24.2.18 and 3.12.2018. 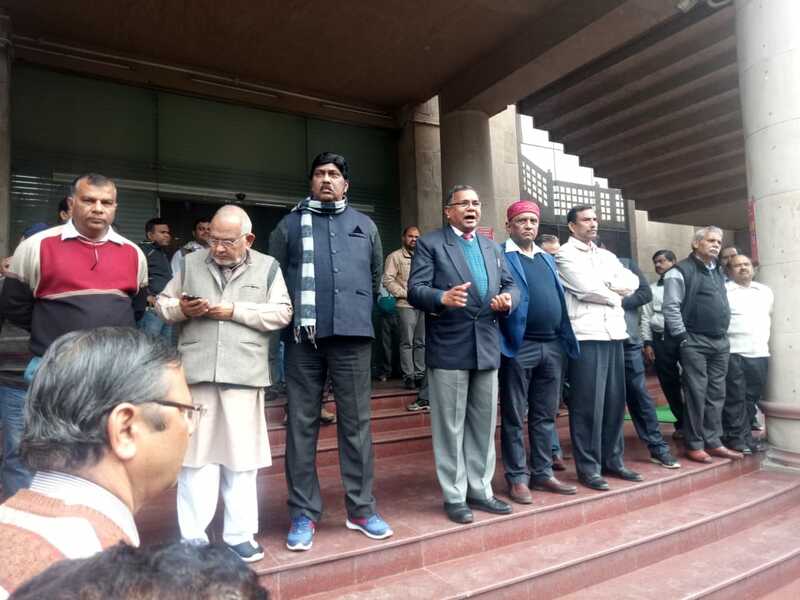 Com Prahlad Rai also briefed about the activities of the AUAB at CHQ level, status and outcome of various trade union action, postponement of the indefinite strike in the month of December, details about various discussions with the MoC / DoT / BSNL management on the demands of the AUAB. He also assured that AUAB will go to any extent to get the issues settled in favour of the employees with the support and co-operation from the field. He requested one and all to be united and support the AUAB of CHQ. Shri Yuvaraj Sambhajiraje Chatrapati, Hon. Member of Parliament in his address mentioned that the demand of the BSNL employees for the PRC is well justified, as when other Govt. departments are entitled for the pay and pension revision, BSNL employees are also eligible for pay revision and pension revision for the retired employees. 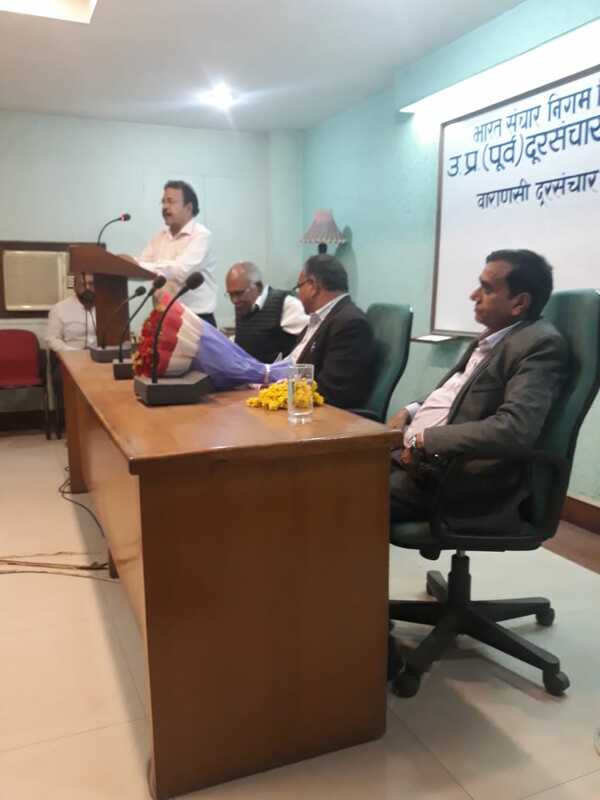 He mentioned that the BSNL network is very good and appreciated the BSNL in providing the network coverage in the rural areas of the Maharashtra. He also stated that even though there are various service providers, every family has at least one BSNL connection due to the reason that the network is available throughout the country in all the nook and corner of the rural areas. He also mentioned that in the case only the private operators’ business is only to be promoted, there was no need of formation of BSNL and commencing the services. He mentioned that due to the BSNL providing network in the nook and corner of the rural villages, villagers are able to contact the hospital and public utility services away from about 40-60 kms from the villages head quarter. He extended his support for continuing the BSNL services for the larger interest of the nation and assured to take up the issue with the new government for settling the grievances of the BSNL employees. While concluding the speech, Hon. M P advised GS AIBSNLEA to meet him at New Delhi and brief the issues to pursue with the Govt. Com C.M. Saste, OS (W), CHQ AIBSNLEA and Com. K.P. Nair, AGS (GD), CHQ AIBSNLEA also address the gathering. Com Rajesh Parulekar, President, AIBSNLEA MH Circle, extended vote of thanks. (a) DE to DGM promotion: We requested to issue early promotion order from DE to DGM (Engg.) to fill-up 891 vacant DGM posts. Director (HR) assured to discuss the matter with PGM(Pers.) for early action. (b) Consideration of request/tenure transfers of SDEs/DEs/DGMs and AOs/CAOs/DGM (Fin. )s: We extended our sincere thanks for issuing long pending DGM(Finance) and AOs transfer orders and requested to consider the SDE/DEs/DGMs (Telecom) transfers also. Director (HR) assured for consideration. Denial of 1st Time Bound Promotion under EPP after 5 years by Pr. CCA Kolkata:- The office Pr. CCA Kolkata while settlement of Pension of the retired executives of Calcutta Telephones, disallowed the 1st promotion given after 5 years under EPP to all the executives. As a result lakhs of rupees have been recovered from their pensionary benefits and their pension was also fixed at lower stage. The estimated no of such executives who got first promotion after 5 years is about 300 in number. Most of them are retired and rest will be retiring soon. We requested Advisor (Finance) to intervene in the matter so that Pr. CCA Kolkata settle the pension cases in the true spirit of EPP. Advisor(Finance) assured to look into the matter for its early settlement. The general elections for parliament and some states throughout India notified schedule of elections from 11th April to 17th May 2019. As per CHQ notification the 6th AIC was notified from 9th to 11th of April 2019 at Vijayawada and the parliament and assembly elections for AP state scheduled on 11th April 2019. As per election code strict rules are being imposed and there will be 144 section for 72 hours before elections on 11th April 2019. The vehicles and hotels and the persons suspicious are under check is already started. Big gatherings and meetings are not permitted as per election code. In these circumstances it is very difficult to organize the 6th AIC which requires several delegates to participate in the Programme, Both assembly and parliament elections were scheduled for AP state on 11th April itself. We have thoroughly discussed with our AP Circle Office bearers and decided to request CHQ to postpone the proposed 6th AIC at Vijayawada. We are ready to organize the 6th AIC at Vijayawada as per the new schedule of dates. In view of the above, AIBSNLEA CHQ has issued notice of postponement of 6th AIC on 14th,15th &16th July 2019 and Pre - AIC CWC meeting on 13th July 2019. (a) Representation received from Shri Sanatan Ojha, SDE Staff No 107678 HR No. 99210932 working in TRAI as Senior Research Officer, Regional Officer, Jaipur, on deputation for posting in BSNL CO New Delhi. OUR sincere thanks to Director(HR), BSNL Board, PGM(Pers), DGM(SEA), AGM(SEA) and Accounts Personnel's of SEA Section. Twitter campaign on Revival of BSNL: Shortly, AUAB is going to start a campaign on ‘REVIVAL OF BSNL’ through Twitter to PMO, narendramodi, manojsinha, CMDBSNL, DoT etc. For that a Twitter account @savebsnlindia will be created by AUAB. Step 1: Create a Twitter account, in case you don’t have. Step 2: Follow @savebsnlindia & also click on ‘Bell Icon’ to enable instant notifications. (a) Representation from Shri N. Bhakta Pothana Rao, HR No. 199203689 JAO regarding Implementation of ACP in respect of Telecom Accounts Clerical Cadre request for grant of financial upgradation (Pay fixation). (b) Representation from Shri N.B. Raj Kumar, AGM, Staff No. 33265, S. Ramesh Kumar, Staff no. 36744 & Chandrashekar N. DGM(L/A) HR No. 198606464 regarding Inclusion of his name in provisional sequence list/provisional seniority list of eligible AGMs for considering for promotion to DGM (T) on ad-hoc basic- regarding errors /omissions. (e) Representation from Shri G.K. Gawali AGM regarding missing of his name in provisional sequence list/provisional seniority list of eligible AGM for considering them for promotion to DGM (T) on ad-hoc basis. The AUAB held a meeting with the CMD BSNL today morning, regarding payment of salary. It is assured by the CMD BSNL that the February salary will be disbursed by 20-03-2019. 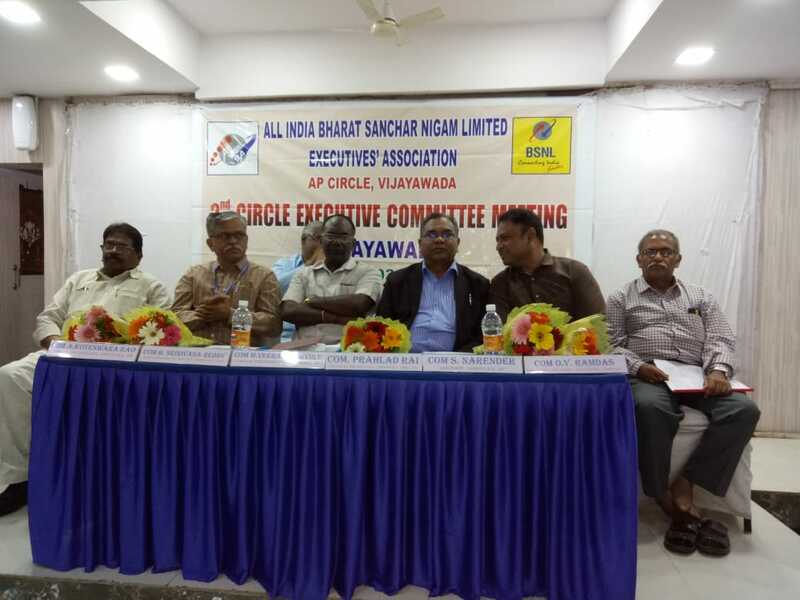 The AUAB demanded a full fledged meeting between the AUAB and the BSNL Management, to discuss the road map for bringing BSNL out of the crisis. The CMD BSNL agreed to hold it shortly. AUAB leaders are meeting tomorrow morning at 11.30 AM for future course of actions. (a) DE to DGM promotion: We requested to issue early promotion order from DE to DGM (Engg.) to fill-up 891 vacant DGM posts, since the CPC has been completed three months before. We requested that the 30 days’ time given in calling the objections on DE seniority List has been completed and now after examining the objections promotion order should be issued immediately. PGM (Pers) assured to look in to the matter. (b) Consideration of request/tenure transfers of AOs/CAOs/DGM (Fin. )s: We requested for consideration of request/tenure transfers of AOs/CAOs/DGM(Fin.)s. PGM(Pers.) mentioned that the clarification from DoT has been sought from DoT today in respect of Code of Conduct. After receiving the clarification necessary action will be taken. (c) Implementation of Rule 206 as per the Hon’ble Supreme Court order: We requested the PGM (Pers) to implement the Rule 206 as per the Hon’ble Supreme Court order. PGM (Pers) mentioned that the Legal Opinion from ASG has been received and the necessary action in this regard is being taken by the Pers Cell. PGM (Pers) mentioned that ASG has clarified that Expert Committee Report has not been considered by the Hon’ble Supreme Court Judgement dates 14.12.2017. We did not agree the statement of PGM (Pers) and mentioned that now further litigation will take place in terms of Contempt of Court. 5th Circle Conference of AIBSNLEA UP (WEST) Circle was organized on 08.03.2019 at the Hotel Ganpati Palace’s Conference Hall, Mathura in a grand manner. It was attended by Com President Shri S.Shivakumar, Com. GS Shri Prahlad Rai and Organizing Secretary (North) Com. Devesh Sharma from AIBSNLEA CHQ side. The PGM Mathura Shri Suryakant was the Chief Guest in the Conference. Shri Babulal DGM (P & A) Mathura and Shri D.P.Sharma IFA Mathura attended the OPEN SESSION as special guests. Circle Secretary AIBSNLEA UP (WEST) Shri Jagmohan Meena welcomed all the dignitaries. All the dignitaries on the dias were warmly welcomed by garlanding and presenting mementoes. 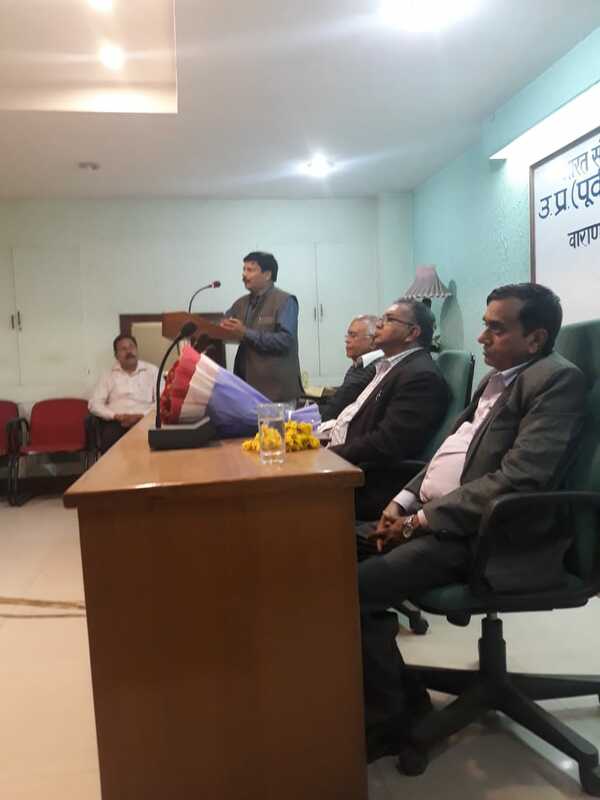 Shri A.H.Khan Circle President AIBSNLEA UP (WEST) in his welcome address welcome all the dignitaries and appreciated the achievements of AIBSNLEA CHQ specially GS AIBSNLEA in continuously resolving the issues of BSNL Executives. 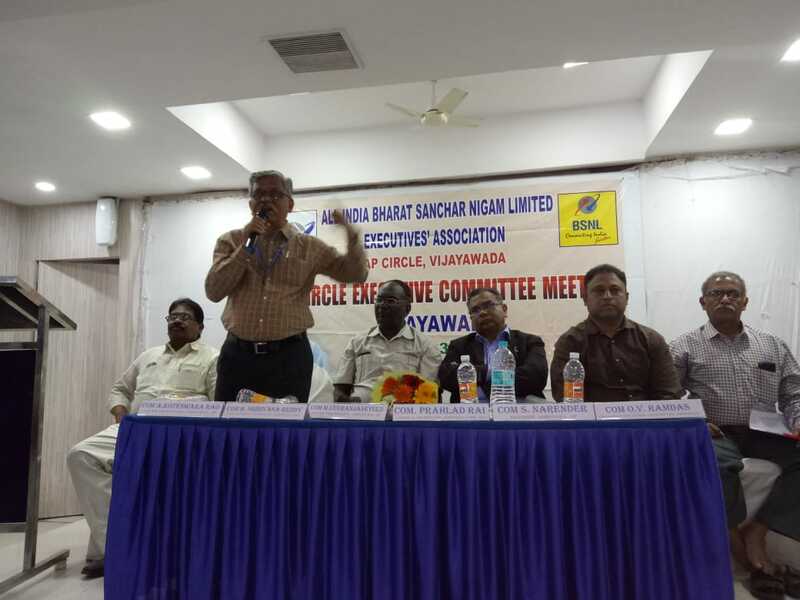 Shri Jagmohan Meena Circle Secretary AIBSNLEA UP (WEST) in his key note address appraised the role of AIBSNLEA Circle body in resolving the issues of the Executives' of UP (WEST) Circle. He thanked the CHQ for its tireless efforts for resolving the UP (WEST) Circle Executives' problems. He hoped that BSNL will flourish in the days to come. At last he welcomed the entire distinguished guests for their esteemed presence in the Circle Conference. Com. Devesh Sharma, Organizing Secretary (North) CHQ in his address congratulated the UP(W) comrades for the successful conduction of the Circle Conference. He appealed to enhance the membership of the AIBSNLEA in UP West Circle in the days to come for winning the next referendum. He expressed his full belief that in the days to come, the comrades of UP(W) Circle will participate in the Association’s calls with full spirit, Strength and enthusiasm. He mentioned the importance of the participation of the members of UP(W) Circle in Organizational calls and its impact on the entire country for getting resolves the issues. At last he wished for the grand success of the Circle Conference. Com. S.Shivakumar All India President in his address conveyed his gratitude for the successful Open Session. He mentioned in detail the fact about delay in salary of Feb 2019 and the efforts made by the AIBSNLEA for its release. He appealed all to work together for getting more and more revenue for BSNL. He mentioned the important role of BSNL in natural calamities and terrorists attacks. He informed that DoT, due to overzealous attitude not providing any support in the form of Letter of Comfort to BSNL. Com. President explained the efforts of AIBSNLEA especially GS for issuing the historical 13000 Executives’ promotions in one months time. He also mentioned that AIBSNLEA is the only Association which is persuing the issues in DoT every day. Com. President concluded with the wishes of the grand success of Open Session. Com. 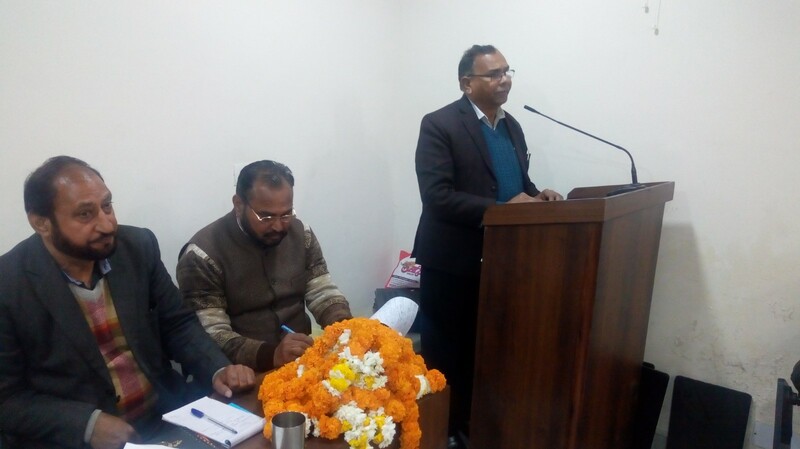 Prahlad Rai GS AIBSNLEA, congratulated the comrades of UP (West) Circle for the successful Open Session and thanked the comrades for their participation. He congratulated all for the elaborate arrangement of conference and making the UP (West) as an important circle in North Zone due to near location of Delhi. In his detailed address Com. GS mentioned that the UP(W) Circle is a very important Circle for the AIBSNLEA and as well as BSNL . Com. GS mentioned that the viability and existence of BSNL is the most important issue today and we have to analyze the reasons of BSNL's today's position of huge financial crunch. Com GS informed that after more the 10000 Crores profit in 2004-05, in recent past years BSNL have made the Losses , which is a serious concern for all of us. In his detailed address Com. GS mentioned that due to un-helping and over-jealous attitude of the Govt. officers i.e. non-payment USOF Charges i.e 2000 Crores/Annum from July 2011, withdrawal of ADC from July 2008 , Exhausting 36000 Crores BSNL reserve, spectrum charges (3G & BWA) of Rs. 18,500 Crores, non-reimbursement of licenses fee has adversely affected the viability of BSNL and is contrary to the provisions of NTP 1999. In addition of this Spectrum Allocation and bidding process on high rates are the example of step behavior of Government towards BSNL, which is a Government owned company. Com. GS informed that 4G spectrum and technology is a must in BSNL for the public perception and its requirement. Com. GS explained the reasons to defer the earlier strike call of AUAB and explained the Charter of Demand of AUAB. He congratulated all for the historic success and 88% participation in the recent AUAB strike. He informed that AIBSNLEA is a strong component of AUAB and Joint struggle with the Unions and Associations is the need of the time. He informed that how the AIBSNLEA is continuously pursuing the viability related issue with the BSNL Management and DoT. He mentioned about AIBSNLEA’s original theme of Customer Delight Year/Month, SWAS etc. Com. GS opposed the move of the Government for non issuing the ‘Letter of Comfort’ to BSNL which has the lowest debt in the Telecom market and expressed its negative impact on BSNL. He informed that only due to the efforts of AIBSNLEA the BSNL MSRRs came into effect in 2009 which paved the way of the promotions up to regular DGMs and our DRs will get the promotion upto PGM level. Com GS also informed the house that initially only AIBSNLEA created the gravity of the DRs issues like SAB and Standard pay scales etc. Com. GS explained in detail the efforts of AIBSNLEA in getting resolved the important HR issues after the formation of BSNL like creation of Transparent Transfer Policy, introduction of EPP etc. He appraised the status of HR issues about AIBSNLEA efforts for various DPCs in various cadres by which more then 13000 Executives has got regular promotions in one month time, Restructuring of AD(OL) cadre, creation of PPS posts in field Units, efforts for smooth CPSU cadre hierarchy etc. Com GS further explained the role of AIBSNLEA in the viability of BSNL. GS assured that our next target is to make efforts to issue other 10000 promotions of BSNL Executives in various cadres. Com. GS explained that how the AIBSNLEA is continuously pursuing these HR and BSNL’s viability related issue with the BSNL Management and DoT. Com. GS again congratulated the UP West Circle for the grand success of the Circle Conference and replied all queries raised by the AIBSNLEA UP West comrades. At last he appealed the all Executives' for make every effort with a team spirit for BSNL’s survival as a viable and vibrant organization. Shri Suryakant PGM Mathura and Chief Guest of the Open Session, thanked the AIBSNLEA UP(West) Circle of the successful holding of the Circle Conference. He praised the role of the BSNL in natural calamities and hilly areas. He appealed all to contribute vigorously for the growth of BSNL in this crucial time. At last he thanked to AIBSNLEA UP(W) for inviting him in the Circle Conference. At the end of the Circle Conference the elections were held for the new Circle body for the next term. Com A.H.Khan IFA Pilibhit, Com. Jagmohan Meena SDE Mathura and Com. 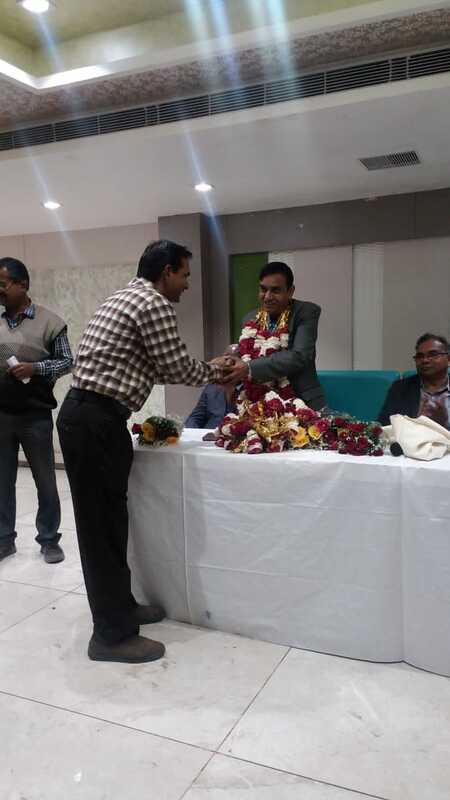 Sudhakar Goyal SDE Agra, were unanimously elected as Circle President, Circle Secretary and Circle Treasurer for the next term. Com. D.P.Sharma, District President Mathura extended the vote of thanks. 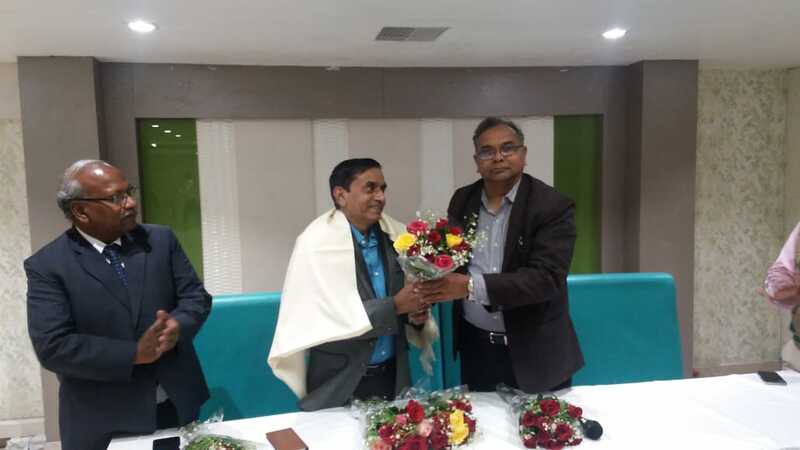 07.03.2019: Meeting with Shri Anupam Shrivastava, CMD/BSNL: AUAB leaders met CMD/BSNL and held discussions regarding disbursement of salary for the month February, 2019 and the repressive measures initiated under FR 17A against the employees on strike, especially the Executives. GSs and Senior Leaders of BSNLEU, NFTE, SNEA, AIBSNLEA, AIGETOA, BSNLMS, BSNLOA and TEPU were present. DIR(HR) was also present in the meeting. On the repressive measures, AUAB explained that FR 17A is not part of CDA Rules or it is not adopted by BSNL so far and hence it is not applicable for BSNL employees. The action initiated under FR 17A is not valid, AUAB explained to management. CMD BSNL & Director(HR) assured to look into the matter. Accordingly, the proposed Relay Hunger fast by CHQ leaders of AUAB at New Delhi from 12.03.2019, demanding salary payment and withdrawal of suppressive measures will not be conducted on the basis of assurances given by CMD BSNL. 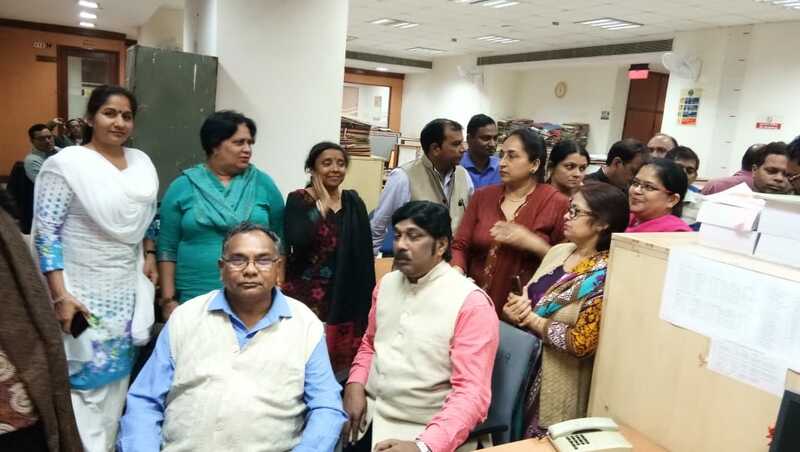 07.03.2019: AUAB Meeting at Delhi: Non-payment of salary and vindictive actions - AUAB to organise hunger strike at Corporate Office. The AUAB conducted it's emergent meeting today the 07.03.2019. General Secretaries /Representatives of BSNLEU, NFTE BSNL, SNEA, AIBSNLEA, AIGETOA, TEPU, BSNL MS, BSNLOA attended. Meeting discussed the following. >>>Non-payment of salary to the BSNL Employees for the month of February 2019. >>>Vindictive actions against AUAB Leaders, particularly leaders of Executive Associations. >>>Issues in the charter of demands submitted by AUAB. >>>To meet CMD BSNL, immediately after the meeting, on the issue of non payment of salary of Feb 2019 and vindictive actions. >>>To organise Relay Hunger Strike from 12th March 2019 at Corporate Office. >>>If issues are not settled, hunger strike is to be organised at circle and SSA levels. >>>To organise the March to PMO in April,2019. 06.03.2019: Meeting with DGM (Pers): GS and President met DGM (Pers) and discussed regarding the regularization of the date of Promotion of AGMs/DEs as 29.6.2018 irrespective of their date of joining duty and extension of subsequent benefits if any with respect to the date of Promotion on 29.6.2018 pursuant to the instructions contained in AGM (Pers.I) BSNL CO, New Delhi Letter dated 4.7.2018, 5.7.2018 & 6.7.2018. In this regard we informed the DGM (Pers) that AIBSNLEA has written a letter to the GM (Pers) on 03.10.2018 along with the Clarification sought by the CGM Kerala Circle on 27.7.2018 but till date no clarification was not issued by the Pers. Branch of the BSNL Corporate Office to Kerala Circle or other Circles. After detailed discussion DGM (Pers) assured to issue the clarification shortly. 05.03.2019: AUAB Leaders Meeting with Director (CFA/CM/Finance) Shri Vivek Benzal : AUAB Leaders met Director (CFA/CM/Finance) and expressed our serious concern and protested against the non-disbursement of February 2019 Salary to all the Circles except BSNL Corporate Office, Kerala, Odisha and J&K Circle. AUAB Leaders also informed the Director (CFA/CM/Finance), this partial attitude of disbursement of February 2019 Salary in a selective manner to some of the Circles created frustration and demotivation among the BSNL Employees. Director (CFA/CM/Finance) informed that he has taken over the charges of Director(Finance) today morning only and assured AUAB Leaders to analyse the financial condition and to take immediate action for the payment of the February 2019 Salary. He further mentioned that Circles are demanding funds for Operation and Maintenance which also needs to be seen. A) Payment of February 2019 Salary: We expressed our serious concern against non-disbursement of February 2019 Salary to all the Circles except BSNL Corporate Office, Kerala, Odisha and J&K Circle. Dir (HR) appreciated our concern and mentioned that now Director (Fin) Charge has been made over to Director (CFA) who will be looking in to the matter. However, efforts are being made for arranging funds to release the February 2019 salary but now everybody should try to increase the Revenue of BSNL to ensure timely disbursement of salary. B) DE to DGM (T) Promotion: We requested to issue DE to DGM (T) Promotion orders to fill up about 900 vacant DGM (T) Posts. We also resented against the 30 days’ time given in calling the objections on DE Seniority List whereas it could have been 15 days’ time also to examine the Seniority based on the objections and issuing Promotion orders. Dir (HR) assured to discuss the matter with PGM (Pers) for an early action. C) Request transfers in the cadre of DGM (Fin): We requested Dir (HR) for the early issuance of request/tenure transfers in the cadre of DGM(Fin). Director (HR) assured to look in to the matter. 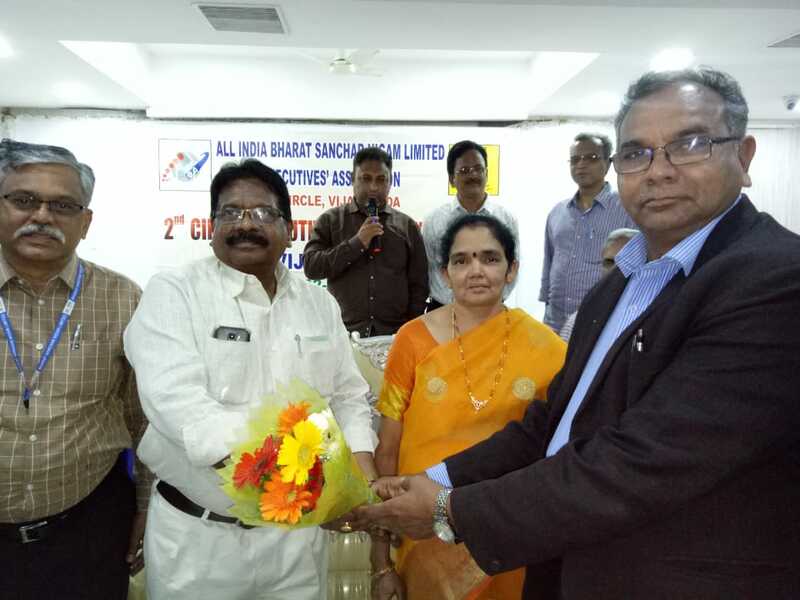 05.03.2019: 2nd CEC of AP Circle on 02.03.2019: The 2nd CEC of AP Circle was conducted on 02.03.2019 at Hotel Swarna Palace Governor pet Vijayawada in a grand and pleasant manner under the presidentship of com .M .Veeranjaneyulu . Com. 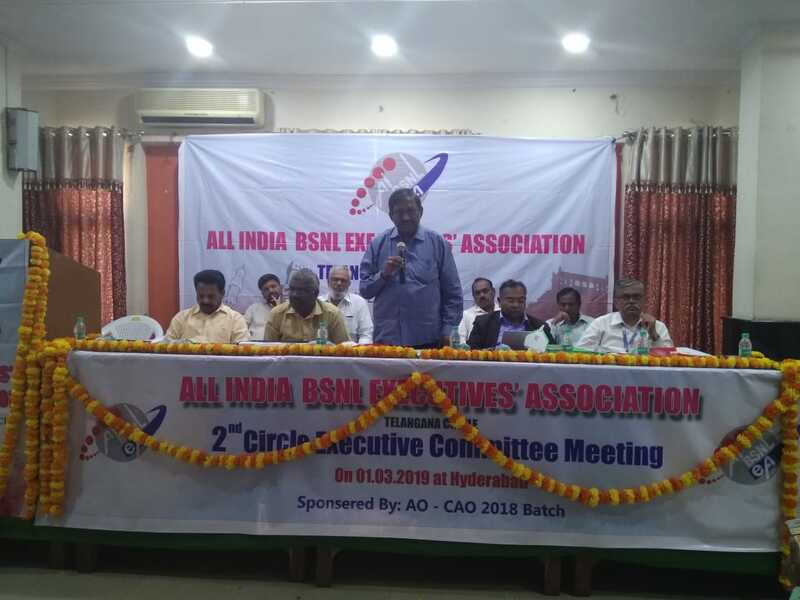 A. Koteswara Rao CS , all the District Presidents, District Secretaries, ACS, Advisers, Circle office bearers and Adviser (South) attended the meeting. Welcome address given by Com. V. Srinivasa Rao circle vice president The meeting was started with national anthem and also extended condolence to the soldiers who sacrificed their lives in J&K and departed family members of our comrades. 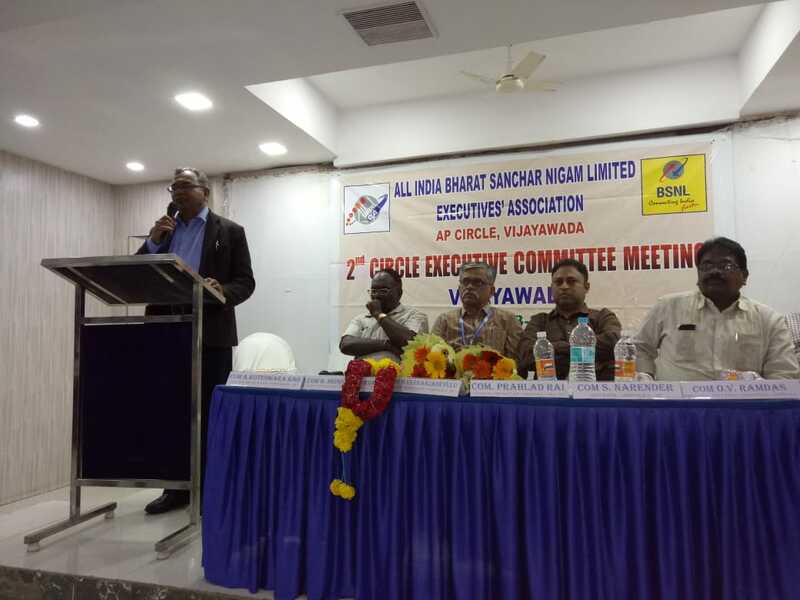 The circle president given his opening remarks for 2nd CEC of AP circle and started the deliberations as per agenda. All the DSs submitted their district secretary reports with the particulars of membership ,Diaries received ,souvenir collection and contribution for the proposed 6th ALL INDIA CONFERENCE AT VIJAYAWADA .The morning session was continued till 14.00 hrs. and given break for lunch. Our beloved General Secretary Com. Prahlad Rai, Com. B. Srinivasulu Reddy AGS (Engg) and Com. S.Saya goud CS Telangana circle were joined in the meeting. The post session after lunch was started at 14.45 hrs. Com. 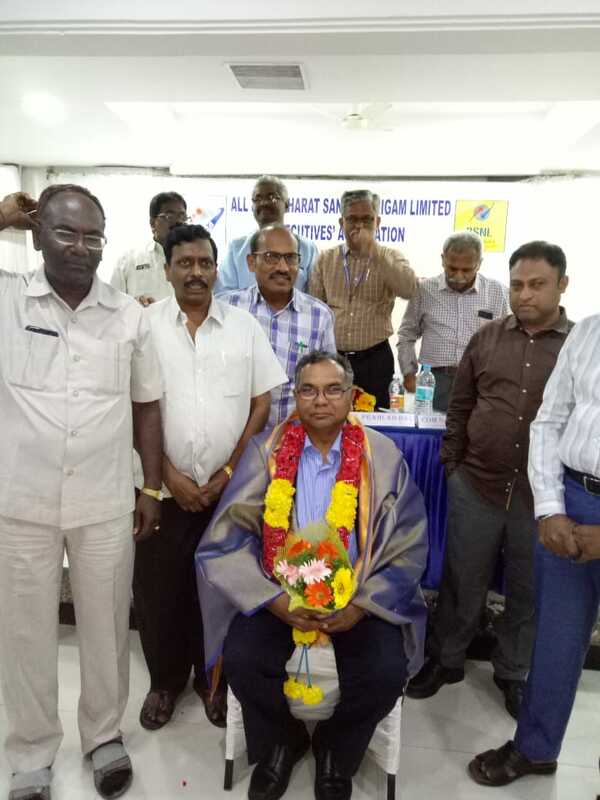 V.Srinivasa Rao vice President welcomed and invited Com. Prahlad Rai GS, Com. B.Srinivasulu Reddy AGS (Engg) and Com. S.Saya goud CS TS circle to the dais. Com. A. Koteswara Rao CS AP circle presented the CS report for the period from 19 .07.2018 to 1.03.2019 with all the activities of members and organisation & agitational programmes. CS also elaborately discussed the issues of 6th AIC to be conducted at Vijayawada on 9th,10th and 11th April 2019. And also he requested all the members to cooperate each other and to participate actively for the successful conduction of 6th AIC at Vijayawada and also requested CS TS Circle to give full support to this programme. Com. S.Narender Adviser (South) addressed the meeting and mentioned different activities involved in 6th AIC. Com. S. Saya Goud, CS TS Circle addressed the meeting and assured their full support for conduction of 6th AIC at VJ. Com. 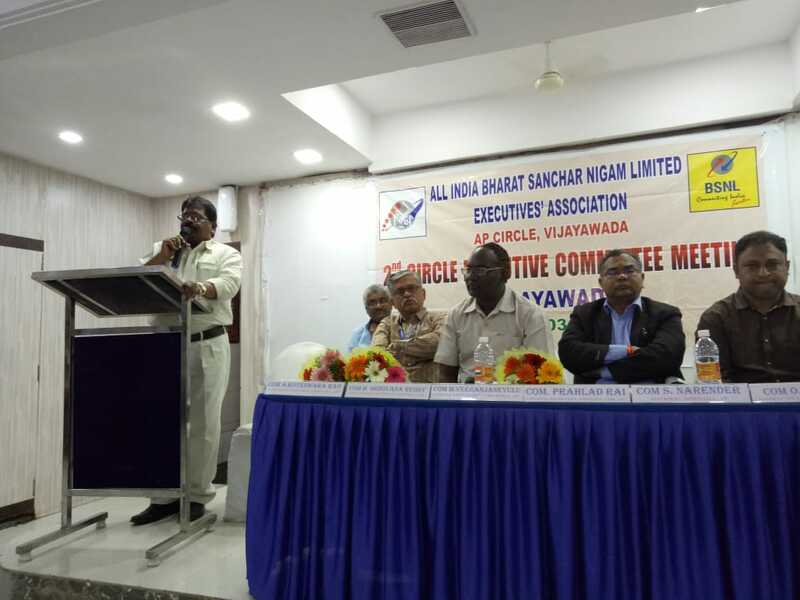 B.Srinivasulu Reddy AGS (Engg) addressed the gathering and discussed all the issues in connection with 6th AIC at Vijayawada. Com. 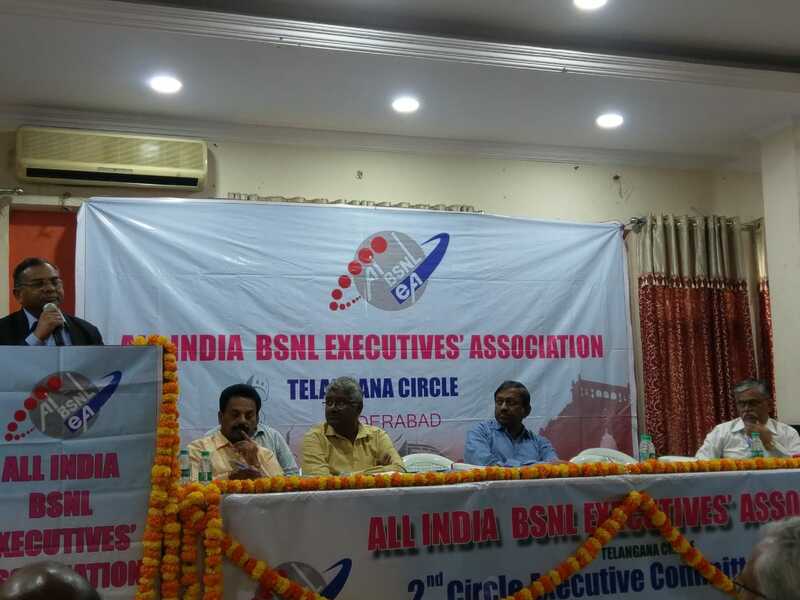 Prahlad Rai our beloved General Secretary addressed the 2nd CEC of AP Circle at Vijayawada and elaborately explained the on going agitation for settlement of issues of 3rd PRC, Pension revision, allotment of 4G spectrum to BSNL and pension contribution on actual basic and other pending issues of promotion i.e. JTO to SDE, SDE to AGM, AO to CAO ,AGM to DGM (T)and PS to PPS also. GS also discussed the issues of 6th AIC at VJ and suggested many issues regarding arrangements, formation of committees for different activities like reception, accommodation, transportation and food for conducting the 6th AIC in systematic and pleasant manner. Com. GS & Com. AGS(Engg.) also visited the venue of 6th AIC conference hall and Pre-AIC CWC meeting Hall at Vijayawada. The meeting was concluded after closing remarks by Circle president Com. M. Veeranjaneyulu and vote of thanks by Com. CH Subramaniyam AO. at 18:00 Hrs. 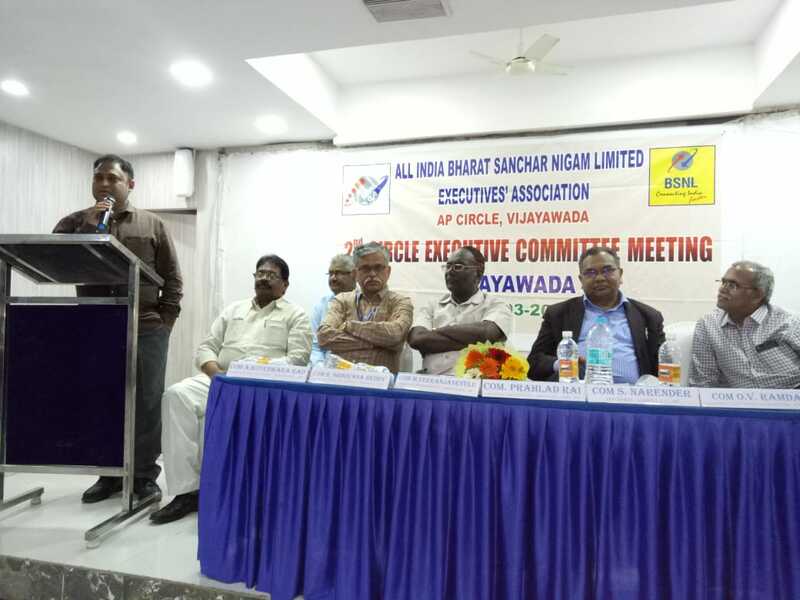 The 2nd CEC of Telangana Cirlce held at Vysya Youth Association Hall, Hyderabad on 01.03.2019. The meeting was presided over by Com. K. Ram Mohan, Circle President. The meeting started at 0930 AM with Flag Hoisting by Com.K. Ram Mohan, Circle President in the presence of Com. Prahlad Rai, our beloved General Secretary and Com B.S. Reddy, AGS(Eng). All the Circle Body along with our GS and AGS(Eng) were welcomed to the dias by Circle Organising Secretary Com. Gupta and felicitated. Com. K. Ram Mohan, President in his welcome address welcomed all the participants and also explained the significance of the conducting of CEC at this crucial juncture. The House was observed one minute silence towards the martyrs of Pulwama departed soldiers. Com S.Saya Goud, Circle Secretary, presented his report on the activities in the circle during the period from 1.8.2018 to till date. 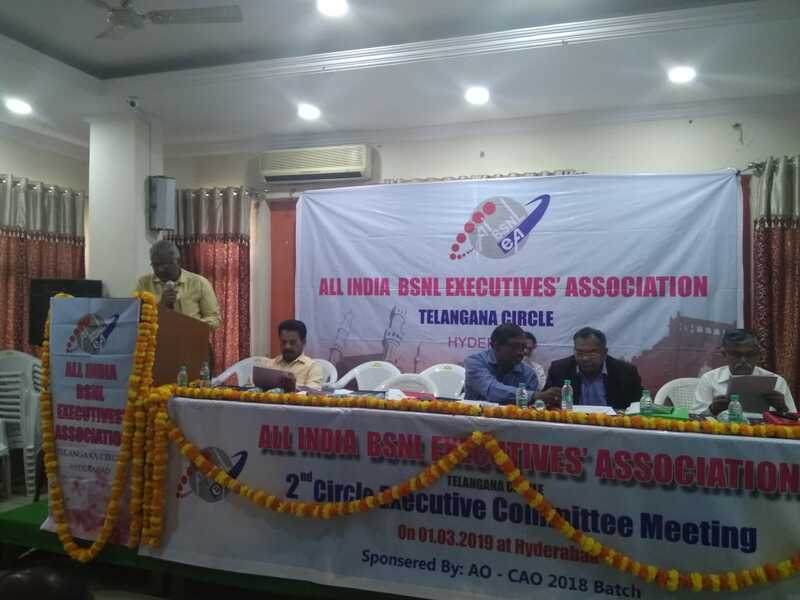 He specially thanked to the CHQ for extending every support to Telangana Circle particularly Com Prahlad Rai, our General Secretary and com B.S.Reddy, AGS(Eng) for his support. Com KNS Shankar Rao, Circle Financial Secretary, presented financial status. All the DSs/Presidents/CEC/Advisors/CWC members addressed the meeting and submitted their reports..
Com B.S. 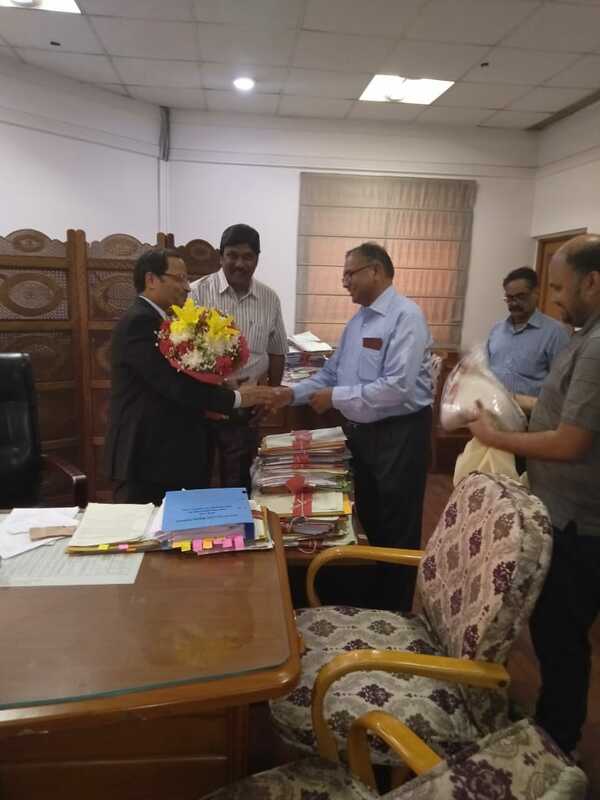 Reddy, AGS(Eng) congratulated the TS Circle body for conducting the CEC and appreciated the efforts of GS, AIBSNLEA in resolving the issues of executives and issuance of thousands of promotions to BSNL Executives in one month. He also appreciated all the members in the TS circle who were participated in the recent 3 days strike. Com Prahalad Rai, GS greeted the CEC for conducting at the crucial juncture and explained the latest status on various pending HR issues and appreciated the TS circle who were participated more than 87 percent in the recent 3 days strike. An Open Session was organized at 4 PM at the same venue. Com. Basha Vali, ACS(Eng), TS Circle welcomed the GS, AGS(Eng), CS ,CP and FS on to the dais and felicitated all. The CEC was sponsored by 2018 AO to CAO promotees batch .During the session, a grand felicitation was organized by the recent AO to CAO promotes of 2018 Batch to our beloved General Secretary Com Prahlad Rai, as a token of gratitude towards our GS, in resolving the much awaited CAO promotions. The Circle Union also felicitated our GS in a token of gratitude . 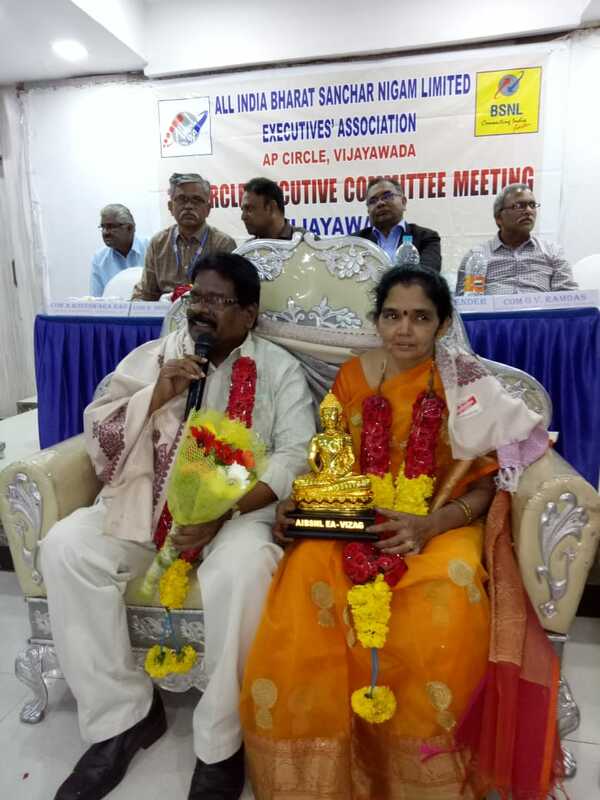 Com GS in his address extended sincere thanks to the Telangana Circle for conducting of 2nd CEC and invited him as chief guest. Com GS extended special thanks to the AO to CAO promotes who were felicitated him in a grand manner and sponsoring the 2nd CEC. Com GS in his address appraised in detail the status of HR issues and viability of BSNL. He also explained the present situation of BSNL and latest status on all the pending promotions /court cases at various levels. 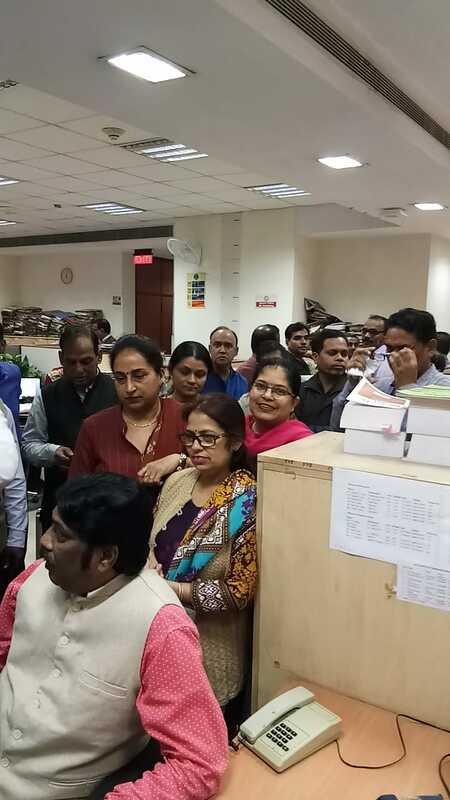 He further explained the untiring efforts made by CHQ for releasing the much awaited CAO promotion orders even to the extent of Gherao the officers at BSNL Corporate office. He further condemned the BSNL management for non payment of February, 2019 salary and showing the divide and rule policy by paying the salary to BSNL Corporate office employees. 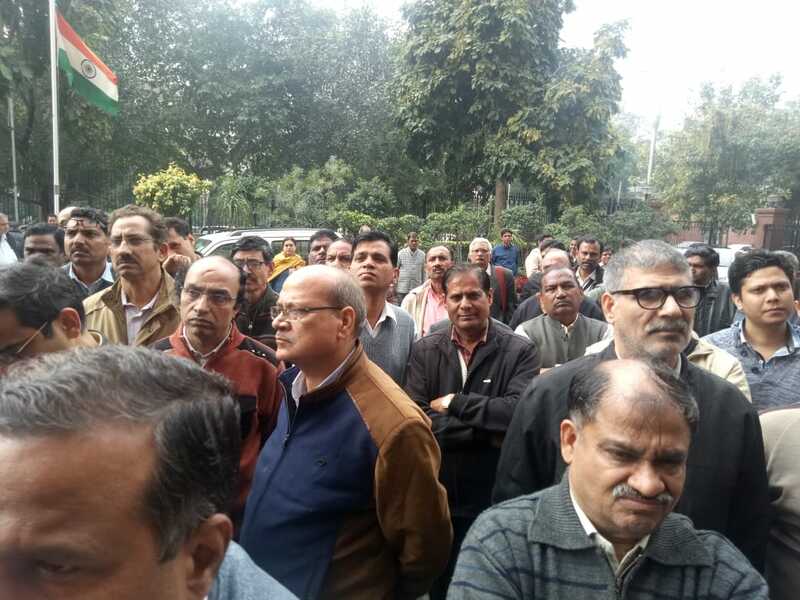 .Demonstrations were also conducted on 1.3.2019 throughout the country against the partisan attitude of BSNL Management. 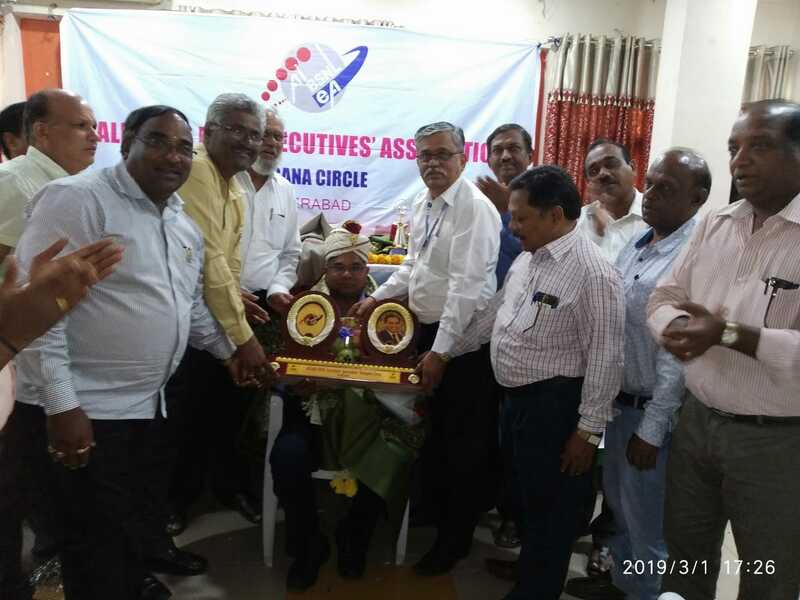 The Circle Union congratulate all the CAO promotes and thanked to the comrades for sponsoring the CEC and conducting felicitation to the General Secretary. The circle union conveys special thanks to com P.V. Satyanarayana, President, HTD Branch for taken a key role for sponsoring the CEC in a very nice manner. The entire meeting hall was Jam Packed with mammoth gathering. Com PV Satyanarayana, President, HTD Branch, extended the vote of thanks with National Anthem. GS attended and addressed GB Meeting of Banaras Telecom Distt. 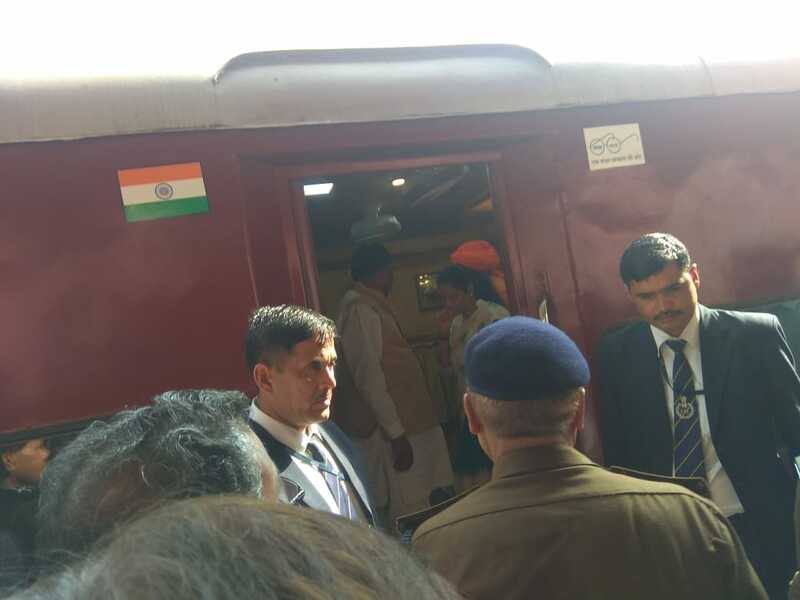 Branch at Varanasi on 26.02.2019 at 17.00 Hrs. Com. GS in his address appraised in details about the status of AUAB demands and mentioned that despite the assurances given by Hon'ble MOSC(I/C) in the meeting held on 24.02.2018 & 03.12.2018 to the AUAB leaders, none of the demands resolved by DoT administration & BSNL Management. This only forced to AUAB to launch 3 days strike i.e. 18.02.2019 to 20.02.2019. He appealed all the employees to continue their efforts for the settlement of AUAB demands and requested Banaras TD Branch employees to approach Hon'ble MOSC(I/C) to his visit at Varanasi & Gazipur during his visit. Also requested Banaras TD executives & non- executives to approach to PMO at Varanasi for settlement of AUAB demands. Com. GS also appraised in details the status of HR issues of executives mainly the CPCs i.e. JTO to SDE, SD to DE, DE to DGM, JAO to AO, AO to CAO , CAO to DGM(F) and Electrical/Civil etc. Com. A.P. Singh, OS, UP(E) Circle in his welcome address appraised regarding rally organised upto PMO by Banaras TD AUAB members. 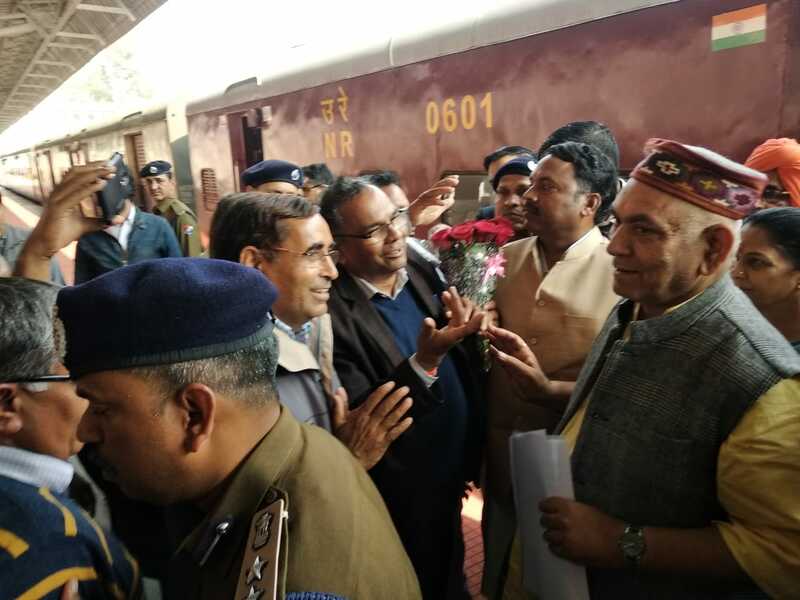 He also appraised that recently they met Hon'ble MOSC(I/C) at Banaras & submitted memorandum during his visit at Varanasi wherein Hon'ble MOSC(I/C) gave positive assurances. Com. Amit Prasad Verma, Distt. Secretary, Banaras Branch assured to continue their efforts with the Hon'ble MOSC(I/C) and PMO for the settlement of AUAB demands. Com. V.P. Singh, President Banaras extended vote of thanks. In continuation of the 3 day strike, the AUAB had given call to organise a March to the PMO on 06.03.2019, for pressing the settlement of the demands. However, tension is building up in the India Pakistan border. In view of this situation, the AUAB has decided to postpone the March to the PMO. Next date of the March will be announced in due course. 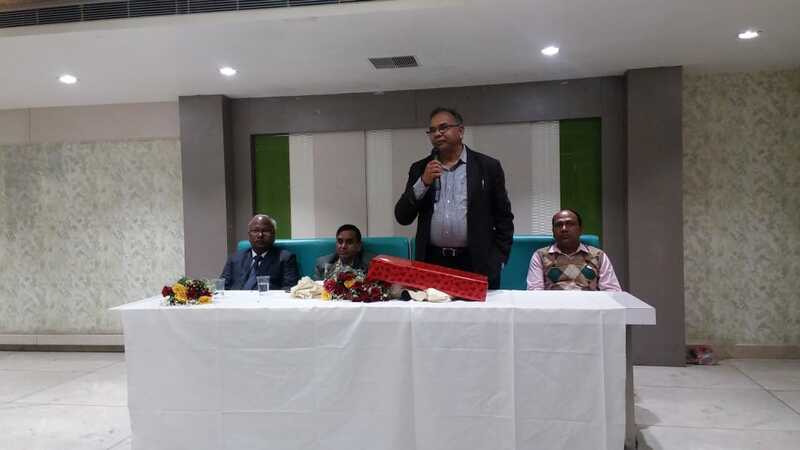 GS attended & addressed the Special GB Meeting of AIBSNLEA in Hotel Muktanand, Civil Lines, Allahabad ( Prayag-Raj) on 26.02.2019. Com. R.P. Gupta DGM(Fin.) & President AIBSNLEA Allahabad Distt. Branch in his welcome address welcomed Com. GS & discussed about current financial position of BSNL & requested CHQ to impressed upon BSNL management for relieving the funds to make the payment of electricity bills, rental of BTS sites, Vendor bills against O&M, employees bank EMIs, GPF/EPF contribution, medical claims etc. He further mentioned that DoT should allot 4G spectrum to BSNL, letter of comfort & financial support to BSNL. Com. GS in his address extended sincere thanks to the Comrades of Allahabad Distt. Branch for arranging Special GB meeting on short notice. Com. GS in his address appraised in details the status of the HR issues & viability of BSNL. He explained that despite assurances given by Hon’ble MOSC(I/C) to AUAB leaders in the meeting held on 24.2.2018 & 03.12.2018 for the settlement of AUAB demands, no settlement of these demands has taken place due to the indifferent & biased attitude of the DoT administration towards BSNL & its employees. He criticized the forces who are trying to destabilize the BSNL from inside & outside. He categorically mentioned that with the strong commitment & conviction of BSNL employees, BSNL could earn profit till the year 2008 & 2009 but Govt. on the basis of withdrawal of ADC to BSNL & took away Rs. 18500 Crs. As 3G & BWA spectrum charges on the highest bidding price without giving opportunity to BSNL to participate in the bidding process. BSNL revenue drastically came down due to predatory price war in the telecom sector. Due to the wrong policies of the govt., BSNL viability has adversely affected. He demanded that Govt./DoT should immediately settle the demands of AUAB for the revival of BSNL. He call upon all the executives & non executives to participate in the Mass Rally to the PMO on 6th March, 2019. On this occasion a grand farewell party was organized to felicitate Sh. V.K. Shrivastava, DGM(Engg.) & Ex. Distt. Secretary of AIBSNLEA Allahabad Distt. Branch on his retirement on superannuation on 31st Jan., 2019. All the members present in the meeting admired the services rendered by Com. V.K. Shrivastava to BSNL & AIBSNLEA. Com. GS in his address appraised the efforts & contribution made by Com. V.K. 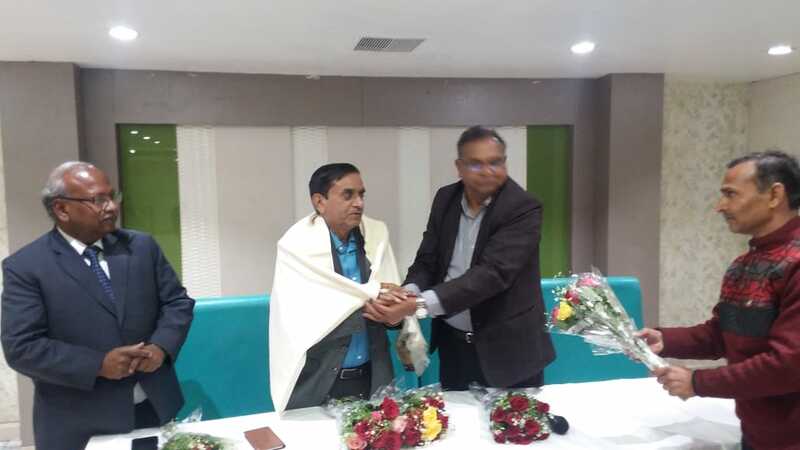 Shrivastava to strengthen AIBSNLEA in Allahabad Telecom Distt. & make AIBSNLEA No. One Executive Association in Allahabad Distt. Everybody mentioned that Com. Sh. V.K. Shrivastava, DGM(Engg.) was like our guardian in BSNL who guided and supported us. Com. R.D. Kushwaha, Distt. Secretary Allahabad in his vote of thanks expressed his gratitude to Com. GS & Com. V.K. Shrivastava, DGM(Engg.) & Ex. Distt. 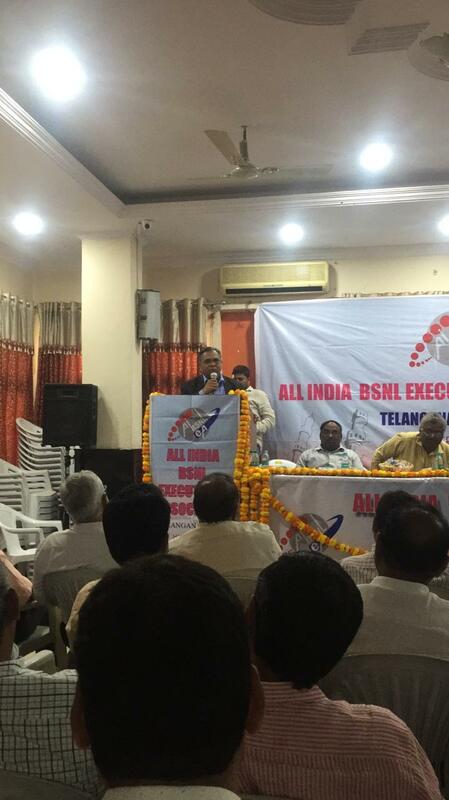 Secretary AIBSNLEA for their dedicated services to the BSNL & AIBSNLEA & for attending the Special GB Meeting. The meeting was convened by Com. S.S. Gupta, OS(E), AIBSNLEA UP(E) Circle. Dinner followed. > Arrival of CHQ Office Bearers / Advisors to CHQ / Circle Secretaries / CWC Members/Consultants. > CHQ Office Bearers / Advisors/Consultants to CHQ Meet at 18.00 Hrs. > CHQ Office Bearers / Advisors to CHQ/Consultants to CHQ / Circle Secretaries /Circle Presidents and CWC Members will be the EX-OFFICIO Delegates. 23.02.2019: Conducting March to PMO on 06.03.2019, by mobilising the employees from the surrounding circles: All Circle Secretaries of surrounding Circles i.e Haryana, Punjab, UP(West), Rajasthan & ALTTC Ghaziabad of the constituents of the AUAB are requested to take urgent steps for mobilising maximum number of executives and non-executives for the March to the PMO, to be held on 06-03-2019. Time at our disposal is very less. Moreover, we are mobilising employees only from the nearby circles. All the nearby Circle Secretaries are requested to take immediate steps for the success of March to the PMO. All the Circle / District Secretaries are requested to coordinate with the other local AUAB Leaders for submitting the memorandum. 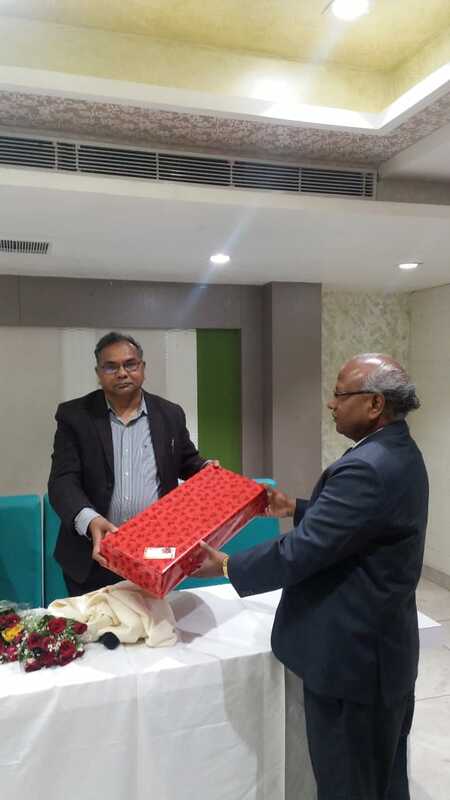 21.02.2019: BSNL Executive Diary-2019: AIBSNLEA CHQ has dispatched BSNL Executive Diary-2019 to all the consignees, who have ordered till date. Further all the Circle Secretaries / District Secretaries AIBSNLEA, Circle Heads /Distt. Heads, BSNL are requested to place Purchase Order to AIBSNLEA CHQ at the earliest so that immediately supply of BSNL Executive Diary-2019 may be ensured. Limited diaries are available. Purchase order may be placed on email to … gsaibsnlea@gmail.com or FAX No. 011-23315315. For more details Sh. Rajpal Sharma, AGS (Fin. ), AIBSNLEA CHQ ND may please be contacted at Mobile no. 09868123459. 21.02.2019: DoT commission seeks revenue assurance from BSNL, MTNL for revival support - Public sector firms BSNL and MTNL have sought financial support, 4G spectrum and approvals for asset sales as part of their revival plans. 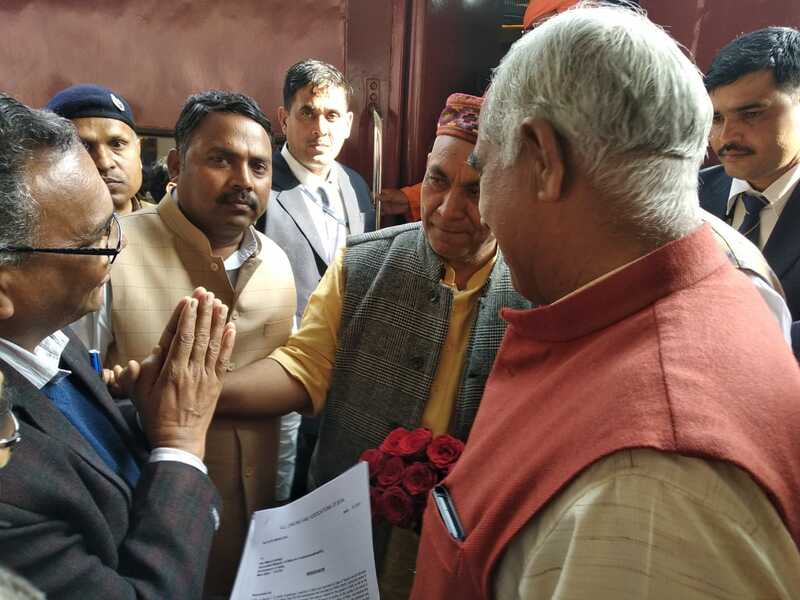 21.02.2019: AUAB Leaders met Hon'ble MOSC(I/C) Shri Manoj Sinha at Jhunjhunu during his visit on dated 21.02.2019 at 15 Hrs. Com. GS AIBSNLEA Sh. Prahlad Rai along with Com. CS AIBSNLEA Rajasthan Circle Sh. M.K. Morodia, Com. Advisor (North), AIBSNLEA CHQ Sh. Karan Singh & other office bearers of AUAB Jhunjhunu Rajasthan Circle met Shri Manoj Sinha, Hon'ble MOSC(I/C) on 21.02.2019 at 15 Hrs. AUAB leaders greeted & presented bouquet to Hon'ble MOSC(I/C) and submitted a memorandum. Today evening at 06.15 PM the representatives of AIBSNLEA Com. L.N. Sharma, Distt. Secy. AIBSNLEA Bikaner TD, Com. K.L. 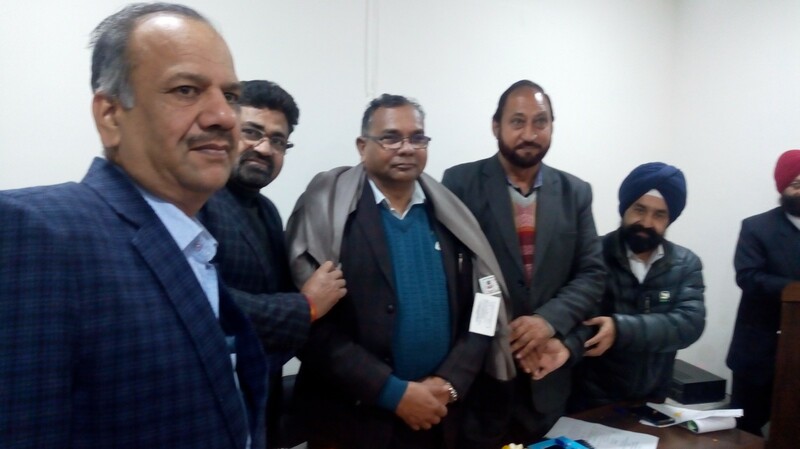 Sunar, Vice President, AIBSNLEA Bikaner TD along with other office bearers met Sh. Arjun Ram Meghwal, Hon'ble Minister of State in Ministry of Water Resources, Govt. of India and requested for his kind intervention for the settlement of AUAB demands and at the same time Com. Sunar connected GS AIBSNLEA Com. Prahlad Rai on telephone wherein Com. GS explained the assurances given by Hon'ble MOSC(I/C) in the meeting held on 03 Dec., 2018 for the settlement but DoT administration is dragging the issues. After detailed discussions, Hon'ble Minister of State in Ministry of Water Resources Sh. 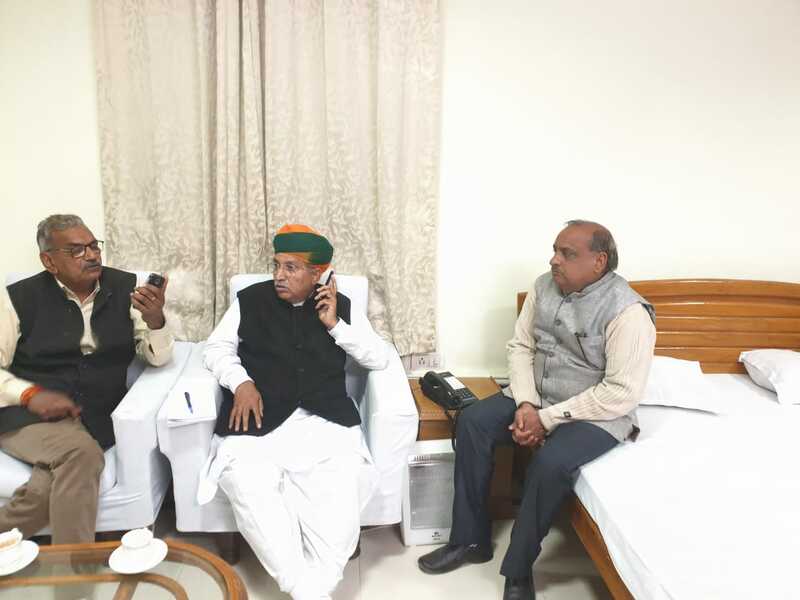 Arjun Ram Meghwal assured to discuss the matter with Hon'ble MOSC(I/C) Sh. Manoj Sinha ji. He also enquired about our agitation programme. We explained him our three days strike successfully completed today evening and in the next phase 'Mass Rally' will be organised by the AUAB to PMO residence on 06th March,2019. 20.02.2019: Decisions of the AUAB meeting held on 20.02.2019. 19.02.2019: Organise the 3rd day strike most effectively- AUAB calls on the employees. The AUAB conducted it’s review meeting today evening. General Secretaries and senior office bearers of the constituents of the AUAB participated in the meeting. The meeting reviewed the 2nd day strike that has taken place in various circles. The meeting expressed it’s satisfaction that the 2nd day strike was very successful. In fact, in some circles, the strike percentage has improved, compared to the 1st day strike. The meeting also took serious note of the letter issued by the Corporate Office, threatening to take action under FR 17A. The meeting resolved to inform the employees that, this attempt of the Management would be stiffly resisted by the AUAB. The meeting also took note of the strike particulars of the various circles, circulated by the Corporate Office. The figures contained factually incorrect details. Finally, the meeting decided to take all out efforts to organise the 3rd day strike more effectively. 19.02.2019: Strike continues with the same intensity for the 2nd Day. The 2nd day strike of the Executives and Non-Executives in BSNL is going on as successfully as it was held on the 1st Day. Encouraging reports are coming from throughout the country. Demonstrations are being organised in each and every place, condemning the government for not allotting 4G spectrum to BSNL, for creating road-blocks in the financial revival of BSNL and also for not settling the 3rd Pay Revision. AIBSNLEA heartily congratulates all the comrades and requests to organise tomorrow’s strike also in the same intensity. 18.02.2019: First day strike a roaring success - AUAB congratulates the employees. The AUAB has heartily congratulated the Non-Executives and Executives of BSNL, for making the 1st day strike a roaring success. In it’s meeting held at 15:30 hrs today, the AUAB reviewed the 1st day strike. General Secretaries and senior office bearers of all the constituents of the AUAB attended. As per the report received from circles, the 1st day strike is near total. It is also observed that the strike is taking place in a totally peaceful manner. On one side, in it’s statement issued through the Press Information Bureau late last evening, the DoT had stated that, it is in the process of negotiating with the AUAB, to resolve the issues. However, on the other side, the DoT has not come forward to invite the AUAB for talks, even after the employees have en-masse joined the 1st day strike. This only shows the double - talk of the DoT. Under these circumstances, today’s meeting of the AUAB, resolved to call upon the employees to further intensify the strike, and make it a cent percent success on the 2nd and 3rd days. 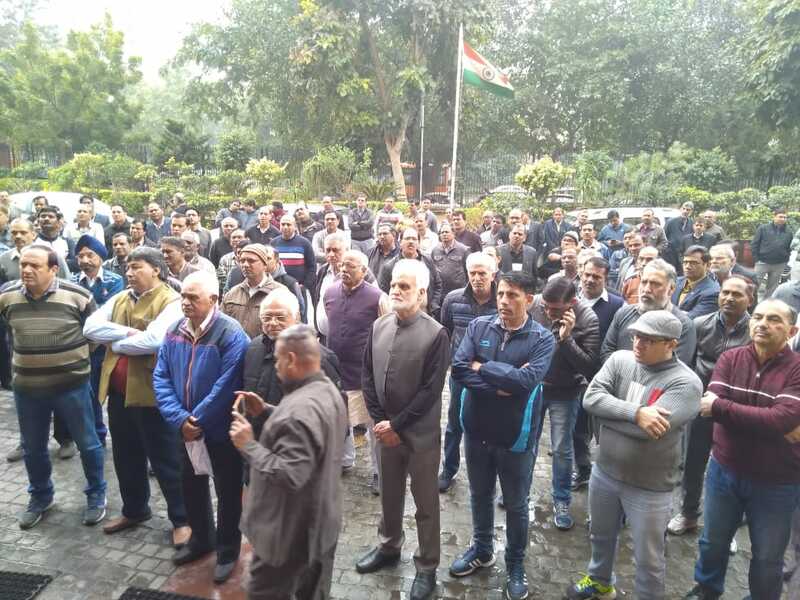 18.02.2019: 3-day Strike implemented successfully in its first day. DOT through PIB has given the Press release that DoT reiterates that positive steps are being taken by the Department in respect of all the demands. But the fact remains that due to non-settlement of the demands even after the assurances given by the Hon’ble MOSC(I/C) to the AUAB Leaders in the meetings held on 24.2.2018 & 3.12.2018 for the settlement of the demands of AUAB. No proper steps are taken by the DoT Administration/BSNL Management for the settlement of the legitimate demands which has forced AUAB to go on 3 days Strike. After the AUAB Strike Notice served on 1.2.2019, DoT Administration has not called the AUAB Leaders to discuss their demands for settlement which pertains to DoT only. BSNL Non Executives and Executives are seriously frustrated and agitated due to non-settlement of their long pending legitimate demands. 6. (a) Approval for BSNL's Land Management Policy without any delay. 6. ( b) Expeditiously complete the mutation and the process of transferring of all assets to BSNL, as per the Cabinet decision taken on the eve of the formation of BSNL. 7. (b) Issue letter of comfort for BSNL's proposals for taking bank loans. 8. Scrap BSNL's outsourcing for the operation and maintenance of it's mobile towers. AUAB further calls upon all the employees to implement three days Strike successfully on second day also with 100% participation. All the Circle/District Secretaries are requested to ensure active participation of all the members in the three days Strike to register our protest against the non-settlement of legitimate demands. 17.02.2019: It is a do or die situation - AUAB calls on the employees to organise the 3 strike massively. After considering all the factors, the meeting unanimously decided to go ahead with the strike. The strike starts from midnight (00:00 hrs.) today. If any clarification is required, comrades are requested to contact their respective General Secretaries. 16.02.2019: AUAB holds review meeting - Decides to go ahead with the strike. A meeting of the AUAB was held today. General Secretaries and senior office bearers of BSNLEU, NFTE , AIBSNLEA, SNEA, AIGETOA, BSNL MS, ATM, TEPU and BSNL OA participated. The meeting paid homage to the 40 CRPF personnel martyred in terror attack at Pulwama. The preparations that have been made in various circles, to make the strike successful, was reviewed. The meeting expressed it's concern that, the DoT has not even come forward to hold any discussion with the AUAB so far. After detailed review, the meeting unanimously decided to go ahead with the strike. AUAB leaders were invited by CMD BSNL on 13.02.2019 at 17.00 Hrs. in the presence of Dir(HR) & GM(SR) to discuss and apprise the developments on AUAB demands in DoT. CMD BSNL informed that today morning AUAB demands were discussed with Secy(T), DoT in details wherein on the issue of Pay revision Secy(T) mentioned that Hon'ble MOSC is ready to discuss with AUAB leaders under a condition that AUAB leaders should agree DOT proposal to decide 0% fitment by DoT itself and 5% fitment proposal will be sent to Digital Commission meeting being held on 21.02.2019 for clearance thereafter it will be taken up in the Union Cabinet for approval. AUAB leaders mentioned that DoT should not put any condition before discussion and other issues related to revival of BSNL should be discussed as assured by the Hon'ble in the earlier meetings held on 24.02.2018 and 03.12.2018. After this meeting AUAB leaders discussed the DoT proposal in its meeting held on 14.02.2019 at 15.00 Hrs. and decided that AUAB will firm to its demand of 10% fitment benefit till the time DoT don't give any concrete proposal in writing to AUAB and this decision was communicated to CMD BSNL by the AUAB leaders on 14.02.2019 at 17.30 Hrs. CMD further appealed to AUAB leaders to review their decision as suggested by DoT so that a meeting can be conducted between Hon'ble MOSC/Secy(T) with the AUAB leaders. In view of this AUAB leaders will further hold its meeting tomorrow on 15.02.2019 at 15.00 Hrs. to discuss and decide on the issue. In the above mentioned developments our CHQ office bearers and Circle Secretaries are requested to give their views/suggestions by today afternoon upto14.00 Hrs to further discuss in the AUAB meeting . CMD further appealed to AUAB leaders to review their decision as suggested by DoT so that a meeting can be conducted between Hon'ble MOSC/Secy(T) with the AUAB leaders. In view of this AUAB leaders will further hold its meeting tomorrow on 15.02.2019 at 15.00 Hrs. to discuss and decide on the issue. In the above mentioned developments our CHQ office bearers and Circle Secretaries are requested to give their views/suggestions by tomorrow afternoon upto13.00 Hrs to further discuss in the AUAB meeting . 12.02.2019: AUAB Meeting with CMD BSNL: AUAB rejects the proposal of the Management for deferring the salary for the month of February, 2019 - AUAB also rejects the appeal of the Management to withdraw the strike. A meeting between the AUAB and the BSNL Management was held today at 17:30 hrs. Shri Anupam Shrivastava, CMD BSNL, Ms. Sujata T. Ray, Director (HR & Finance) and Shri A.M. Gupta, GM (SR), were present. From the AUAB, Com. P. Abhimanyu, Convenor, Com. Chandeshwar Singh, Chairman, Com. Prahlad Rai, GS, AIBSNLEA , Com. K. Sebastin, GS, SNEA, Com. Pathak, AGS, AIGETOA, Com. Suresh Kumar, GS, BSNL MS, Com. H.P. Singh, Dy. GS, BSNLOA and Com. S. Sivakumar, President, AIBSNLEA, participated. 6. a) Approval for BSNL's Land Management Policy without any delay. ……are not implemented by the DoT. The AUAB also told the CMD BSNL that, plenty of time is already given to the DoT, and that the strike will now take place successfully. The AUAB told the Management in categorical term that, there is no question of going back from the decision to go on strike. All the Circle/District Secretaries are requested to make full preparations for the successful implementation of three days strike. 12.02.2019: Meeting with Director(HR), BSNL Board: GS, President met Director(HR), BSNL Board and requested for issuance of DE to DGM (T) promotion order to fill up 891 DGM(T)vacant posts since CPC has already been completed one month before. Director(HR) assured an early action in this regard. 07.08.2018: BSNL Corporate Office, New Delhi issued revision of Seniority List of TES Group- 'B' in compliance of Hon'ble Supreme Court Judgment dated 21.01.2015 and 14.12.2017 in Civil Appeal No (s) 4389 of 2010. 11.02.2019: AUAB Meeting with CMD BSNL: CMD has invited AUAB leaders for discussions on 12.02.2019 at 17.00 Hrs. 11.02.2019: AUAB is holding meeting on 12.02.2019 at 11 Hrs at Ghaziabad & 13.02.2019 at 11 Hrs. at Rohatak for mobilization for 3 days strike implementation. 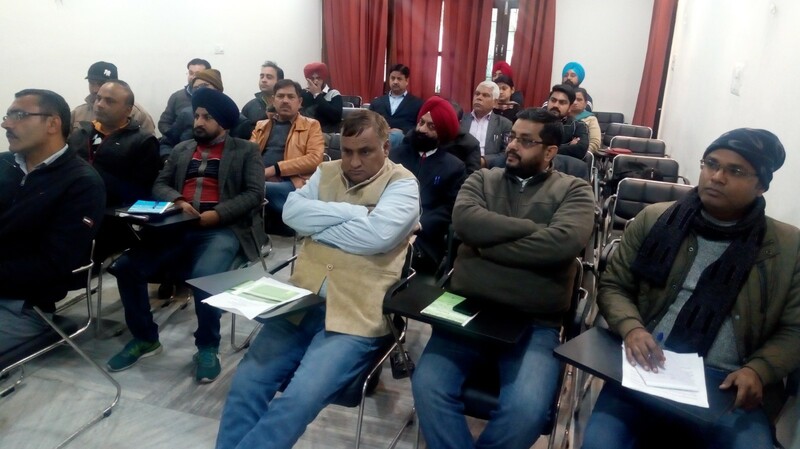 11.02.2019: 2nd CEC meeting of Punjab Circle on 09th February 2019 at Patiala: 2nd CEC meeting of Punjab Circle was organised on 09th February 2019 at Parbhat Parvana Patiala. The Open Session of the CEC Meeting was attended by Com. GS Shri Prahlad Rai and Organizing Secretary (North) Com. Devesh Sharma, from AIBSNLEA CHQ side. DS NFTE Patiala Shri Prem also attended the meeting as special guest. All the distinguished guests were welcomed by presenting bouquets and shawls. Meeting started with National Anthem. Com. Baldev Singh, FS AIBSNLEA Punjab delivered the welcome address and welcomed all the guests in the Patiala City in the 2nd CEC meeting. All District Secretaries of AIBSNLEA Punjab Circle presented the District Secretary reports. Com. Mohd. Jameel, Circle Secretary AIBSNLEA Punjab, in his key note address welcomed all in the 2nd CEC meeting at Patiala. He specially thanked to AIBSNLEA CHQ for extending every support to AIBSNLEA Punjab. He mentioned the achievement of Punjab Circle body in the resolvement of the issues of the members. He also stressed to keep vigilant on the issues of BSNL's viability as well as on our HR issues. Com. 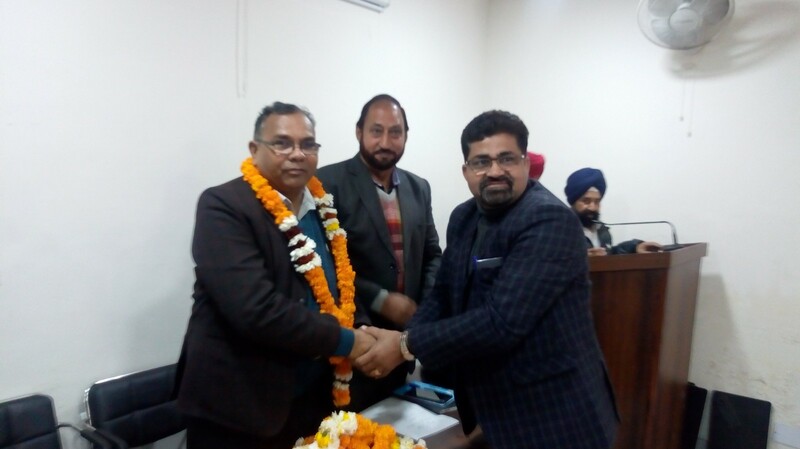 Devesh Sharma, Organizing Secretary (North) CHQ in his address congratulated the comrades of AIBSNLEA Punjab Circle and specially Patiala Comrades for the successful holding of 2nd CEC meeting and thanked the comrades for their grand participation. He thanked for the efforts of GS AIBSNLEA in resolving the issues of 13000 promotions for BSNL Executives in one month. He explained the Punjab Circle's importance for not only AIBSNLEA but also for the entire BSNL as a whole. He expressed his full belief that in the days to come, the comrades of Punjab Circle will participate in the AUAB's organisational call with full spirit, Strength and enthusiasm. He mentioned the importance of the participation of the members of Punjab Circle in Organisational calls and its impact on the entire country for getting the benefits of 3rd PRC. Com. He assured the full support of AIBSNLEA CHQ to Punjab Comrades. At last he thanked to all for inviting him in the open session and congratulated for the grand success of the 2nd CEC. 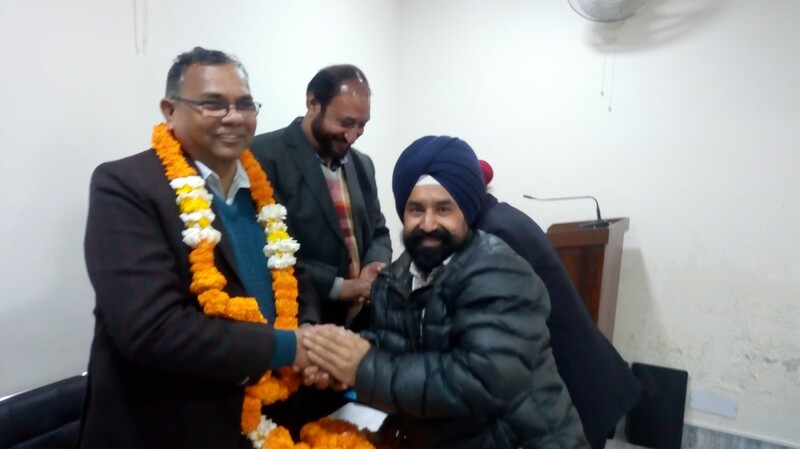 GS AIBSNLEA, Shri Prahlad Rai, congratulated the comrades of Punjab Circle for the successful 2nd CEC meeting at Patiala and thanked the comrades for their participation. In his detailed address Com. GS mentioned that the Punjab Circle is a very important Circle for the AIBSNLEA and as well as BSNL and Patiala is one of the most important SSA in Punjab Circle. Com. GS mentioned that AIBSNLEA has formed by the merging of 10 DoT recognised Associations and every cadre is important for us and we peruses for the resolvement of the pending issues of all cadres. He informed that only due to the efforts of AIBSNLEA the BSNL MSRRs came into effect in 2009 which paved the way of the promotions up to regular DGMs and our DRs will get the promotion upto PGM level. Com GS also informed the house that initially only AIBSNLEA created the gravity of the DRs issues like SAB and Standard pay scales etc. Com. GS categorically told that AIBSNLEA is against the MT recruitment when the existing in house talent like M.Tech/MBA/CA/ICWA are very much available and recruitment of MT will create cadre demoralisation. Com. GS explained the persuasive efforts of AIBSNLEA CHQ for issuing more the 13000 promotions is BSNL through various DPCs. He appraised the status of HR issues about AIBSNLEA efforts for various DPCs in various cadres. Com. GS mentioned that the viability and existence of BSNL is the most important issue today and we have to analyze the reasons of BSNL's today's position of huge financial crunch. He explained the demoralising view of Niti Ayog and DoE on 4G allocation to BSNL. GS emphasized that the approval of BSNL's Land management policy is very much required for improving the financial health of BSNL. GS explained the points of revival plan of BSNL, which are expected to discuss in next Digital Commission meeting on 21st Feb., 2019. Com. GS explained the reasons to defer the earlier strike call of AUAB and explained the existing Charter of Demand of AUAB. Com. GS informed that upto today DoT has not discussed any matter with AUAB about reducing the retirement age to 58. Com. GS appealed to all Punjab Comrades to make successful the 3 days strike call of All Unions and Associations w.e.f 18.02.2019. Com. GS explained that how the AIBSNLEA is continuously pursuing these viability related issue with the BSNL Management and DoT. At last Com. GS congratulated the Punjab Circle for the grand success of the 2nd CEC and replied all queries raised by the AIBSNLEA Punjab comrades. Com. Ashok Sharma, President AIBSNLEA Punjab Circle extended the vote of thanks. DS Patiala Com. Harjot Singh managed the overall arrangements for CEC in a very nice manner. The entire meeting Hall was Jam Packed with mammoth gathering. (a) DE to DGM promotion: We requested to issue early promotion order from DE to DGM(Engg.) to fill-up 891 vacant DGM posts, since the CPC has been completed one month before. PGM(Pers.) appreciated our concern and mentioned that within a day or two DE's seniority list will be uploaded on BSNL Intranet Portal as a transparency measure. However, some apprehensions raised by some executives on DE's seniority list have been examined and further any objections on seniority list are raised will also be examined immediately and after satisfying the objections if any, the promotion orders will be issued from DE to DGM. (b) JTO to SDE promotion: We requested to issue early promotion order from JTO to SDE(T) to fill-up about 5000 vacant SDE(T) posts. PGM(Pers.) mentioned that due to contempt case pending in the Hon'ble CAT Ernakullam bench and now has been posted for hearing on 15.02.2019.After the clearance of contempt case only ,the promotion orders will be considered. (c) Consideration of request/tenure transfers of AOs/CAOs/DGM(Fin. )s: We requested for consideration of request/tenure transfers of AOs/CAOs/DGM(Fin.)s. PGM(Pers.) mentioned that all the pending cases are being examined and will be considered shortly. 07.02.2019: Update on GTI( Group Term Insurance) for BSNL executives : Meeting of Group Term Insurance Committee held today under the Chairmanship of Sr. GM (Estt), BSNL Corporate Office, New Delhi. Committee members GM (Trg) & GM(SR) were participated in the meeting. From AIBSNLEA side AGS (Fin) and AGS (DR) attended the meeting. Representatives of other associations SNEA, AIGETOA and SEWA were also present. In the meeting today, Committee finalized the GTI scheme and the policy documents and it is decided that MoU will be signed in next week. The policy will be effective from 01.03.2019. There will be two schemes with 50 lakhs coverage and 20 lakhs coverage. Those who are above 50 years they can also opt for either 50 lakhs or 20 lakhs scheme. ESS Popup will again be opened for 2 days for exercise/change the options. 06.02.2019: AUAB meeting with Addl. Sect(T), DoT: The representatives of AUAB met Addl. Sect(T), DoT and discussed regarding settlement of AUAB demands. AUAB expressed their serious concern against non settlement of AUAB demands even after assurances given by Secy(T), DoT & Hon'ble MOSC(I/C) in the meeting held on 2nd Dec., & 3rd Dec., 2018. We categorically told that despite the assurances given in the Digital Commission Meeting held on 5th Feb., 2019 for 4G Spectrum allocation to BSNL and issues related to revival of BSNL, payment of pension contribution on actual basic instead of maximum of the pay have not been cleared by IFD(DoT) and not send to DoE. the queries raised by DoP&PW regarding IDA pension revision formula has not yet been replied by DoT. The Cabinet Note on pay revision of BSNL executives & non-executives for relaxing affordability clause of 3rd PRC has not been sent to Cabinet for approval. The left out issues of 2nd PRC are not yet settled. AST explained that in yesterday's Digital Commission Meeting, MTNL revival plan could not be discussed due to some queries. He further explained that in MTNL revival plan, MTNL Management has suggested for reduction of age from 60 years to 58 years, VRS & there is no proposal for pay revision. The BSNL revival plan is now ready but informally Digital Commission has advised to DoT to take the comments of TRAI on this issue in view of the Hon'ble Supreme Court Judgement. Thus 4G spectrum allocation will be send to TRAI for comments shortly. The other issues related to monitisation of non-core land of BSNL & VRS are to be discussed in the next Digital Commission Meeting to be held on 21st Feb., 2019 at 11.00 AM. He mentioned that regarding VRS in BSNL Rs. 6000 Crs. ex-gratia liability will be born by govt. through souvenir guarantee. On the issue of pay revision, AST further mentioned that even 5% fitment benefit on pay revision is difficult to get clear from DoE. On the AUAB demands AST told that he will shortly arrange a meeting with Hon'ble MOSC(I/C). He appealed to defer three days strike. We explained that three days strike notice has been served to draw the attention of govt. fro the settlement of AUAB demands. In case the demands are not settled, AUAB will be forced to resume indefinite strike. 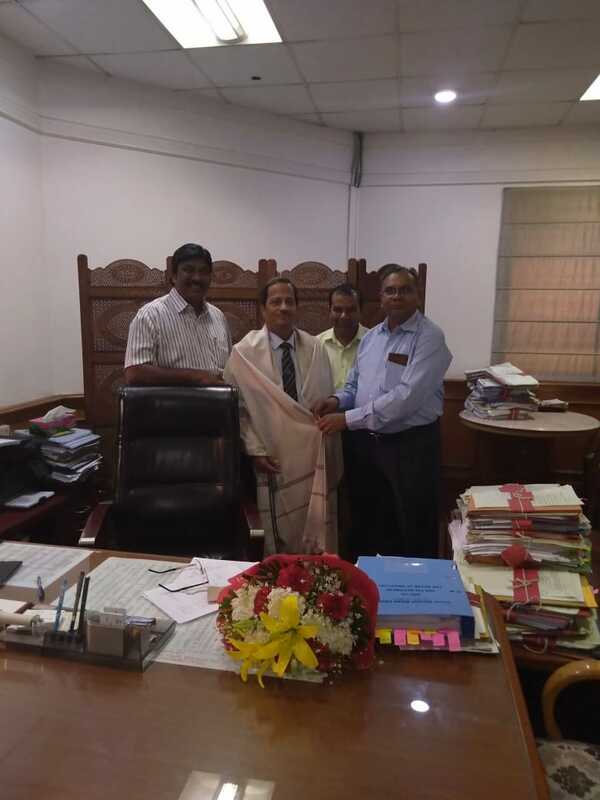 05.02.2019: AUAB Meeting with OSD to Hon'ble MOSC(I/C) on 05.02.2019: AUAB leaders met OSD to Hon'ble MOSC(I/C) Sh. 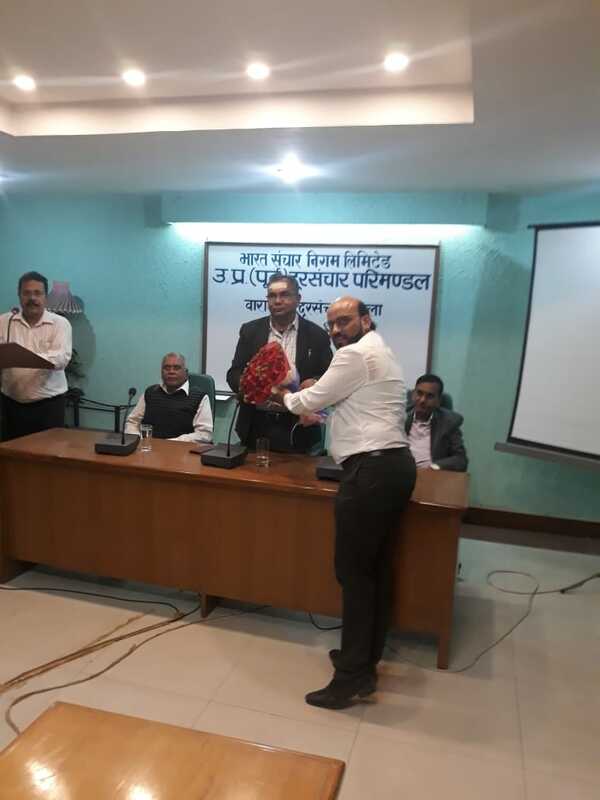 Anand Kumar, for kind intervention of Hon'ble MOSC(I/C) for honoring the assurances given to AUAB on 3rd Dec., 2018. We expressed our unhappiness against the indifferent attitude of DoT officers in settling the AUAB demands even after assurances given by Hon'ble MOSC(I/C) . OSD mentioned that DoT seriously working for the settlement of AUAB demands. However, he immediately called AST Office to submit the status of AUAB demands settlement. AST advised to OSD to send AUAB leaders in his chamber to discuss the matter. Accordingly, AST fixed up the meeting with AUAB leaders on 6th Feb., 2019 at 15.30 Hrs. 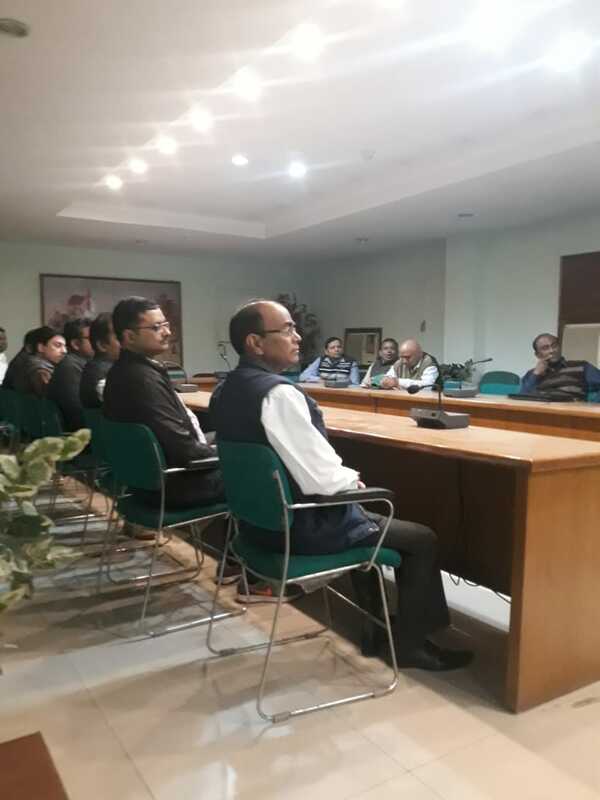 05.02.2019: Digital Commission Meeting held today in DOT:- It is reliably learnt that the revival Plan of MTNL which was in DC agenda could not be discussed today in view of the queries made by IFD(DOT). The revival plan of BSNL is yet to be prepared for want of final report on BSNL'S revival plan from IIM Ahemdabad. In BSNL'S revival plan, allotment of 4G Spectrum to BSNL is also the item for decision. It seems that the issues of revival of BSNL/MTNL are not the Priority items in DOT. 1) To forward the Delegate List of their respective Circle by Mail to the Circle Secretary, of AP Circle Com. 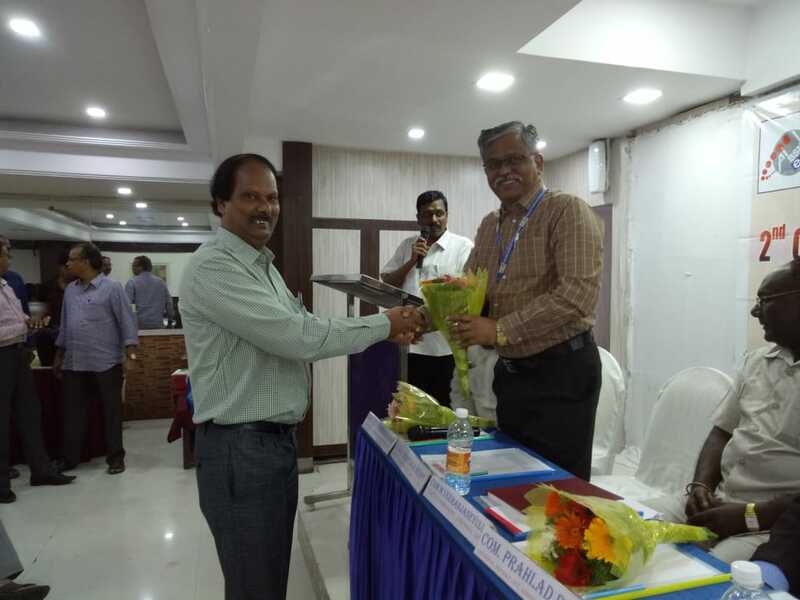 A. Koteswara Rao, DGM for the forthcoming 6th All India Conference of AIBSNLEA scheduled to be held at Vijayawada from 9.4.2019 to 11.4.2019. Mail ID: akrao1959@gmail.com, Mobile No. 094400 00505. 05.02.2019: BSNL Executives' Diary – 2019 : All the Circle/District Secretaries and other concerned are requested to place the purchase orders for BSNL Executives' Diary – 2019 to AIBSNLEA, CHQ at the earliest for early dispatch. Limited stock is available at CHQ. 31.01.2019: AUAB meeting with Additional Secretary (T), DOT and its internal meeting tomorrow : In continuation to the discussion that the AUAB had with the Additional Secretary (Telecom) yesterday, further discussions took place between the AUAB and the CMD BSNL yesterday, as well as today. The representatives of the AUAB met Shri Anshu Prakash, Additional Secretary (Telecom) today afternoon. To their surprise, the Additional Secretary (Telecom) told the AUAB representatives today that, even giving the 5% fitment would be difficult. The AUAB did not accept the 5% fitment offer made yesterday. In this backdrop, the AUAB will be holding it's meeting at 11:30 am tomorrow. The meeting will take appropriate decision on the charter of demands. The Executives and Non-Executives are requested to keep ready for struggle. 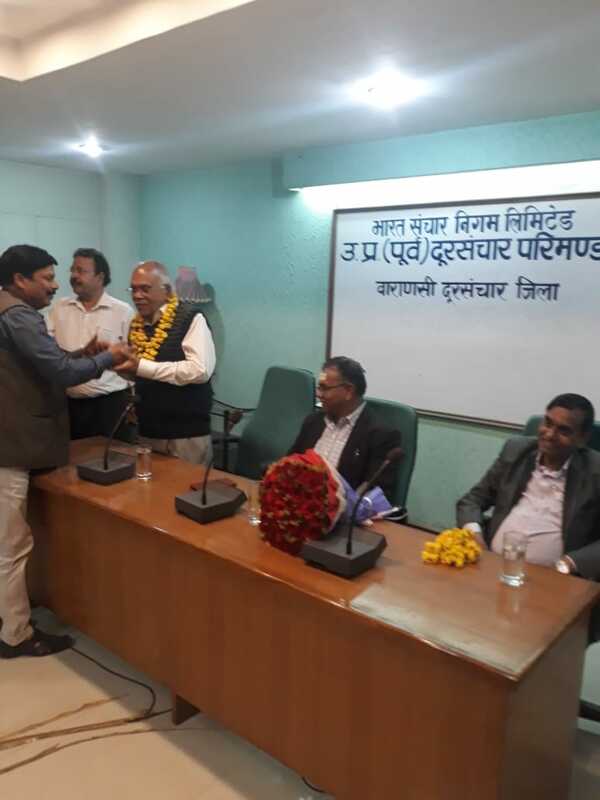 31.01.2019: Meeting with PGM(Pers): GS met PGM (Pers.) and requested to issue promotion order from DE to DGM(Engg.) to fill up 891 vacant DGM posts against which the CPC has been completed one month before . PGM(Pers.) mentioned that the DE seniority list is being uploaded on BSNL Intranet shortly in view of the objections raised by some executives. After receiving the objections, it will examined and promotion orders will be issued accordingly. 31.01.2019: Writ Petition case regarding Tower Subsidiary: The Writ Petition case regarding Tower Subsidiary was listed as Item No. 5 in Court No. 7 before the Delhi High Court today. 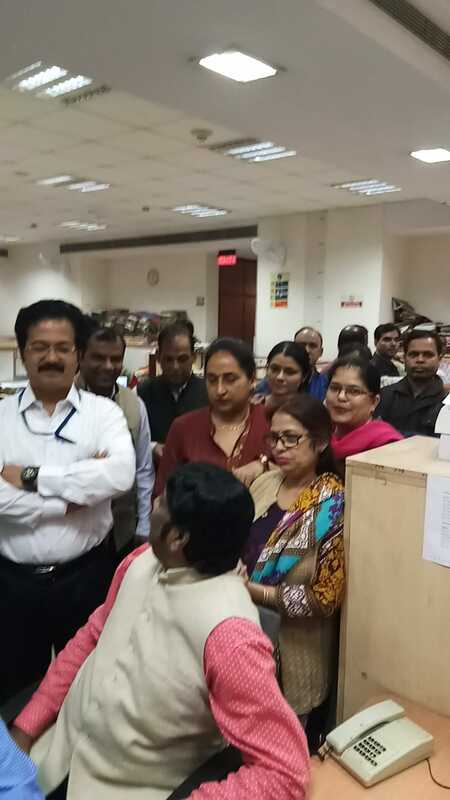 Mr. Rajshekhar Rao appeared on behalf of the Petitioners i.e. AIBSNLEA, SNEA, AIGETOA & others , apprised the Court that DOT was yet to file a response and sought liberty to file a rejoinder to the Counter Affidavit filed by BSNL as also DOT. Accordingly, the matter has been adjourned to 20.08.2019. 30.01.2019: AUAB meeting with CMD (BSNL): GS AIBSNLEA, GS SNEA,GS BSNLEU and GS NFTE met CMD,BSNL in the presence of Director (HR) BSNL Board as per the advice of AST to discuss the viable proposal for pay revision : AUAB leaders demanded 15% fitment benefit for pay revision. Regarding Pension revision less than 15% fitment benefit can not be accepted by AUAB since the pension contribution of the BSNL pensioners was paid BSNL to DOT as per rule. After detailed discussions CMD BSNL mentioned that tomorrow morning 11.00 Hrs; he will be giving a presentation to Secy (T) on revival plan of BSNL including 4G spectrum allocation, monetision of non core land of BSNL, pay revision, payment of pension contribution on actual basic pay and pension revision wherein views of AUAB will also be presented. 30.01.2019: Court case against creation of BSNL's Tower Subsidiary Company : Writ petition filed by AIBSNLEA, SNEA, AIGETOA and others against the creation of BSNL's Tower Subsidiary Company in the Hon'ble High Court Delhi is coming for arguments tomorrow in the Court No.7 at case no.5 in the Hon'ble High Court Delhi. BSNL has filed the rejoinder but DOT is yet to file the rejoinder. 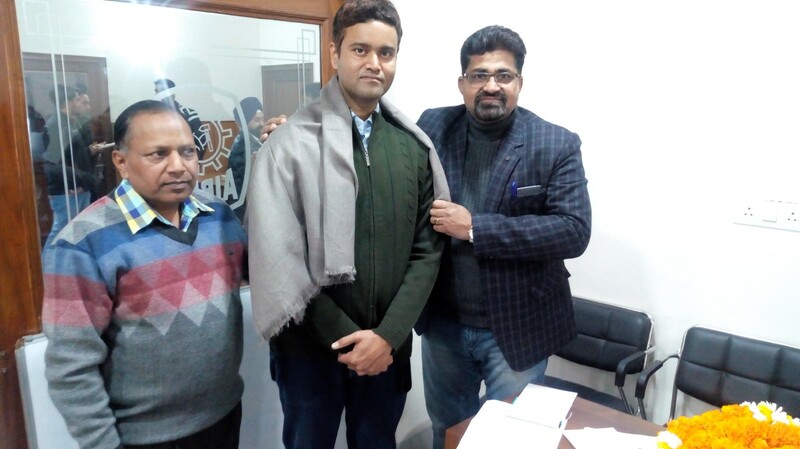 30.01.2019: Meeting between AUAB and the Additional Secretary, Telecom: A meeting was held today between the AUAB and Shri Anshu Prakash, Additional Secretary(Telecom). 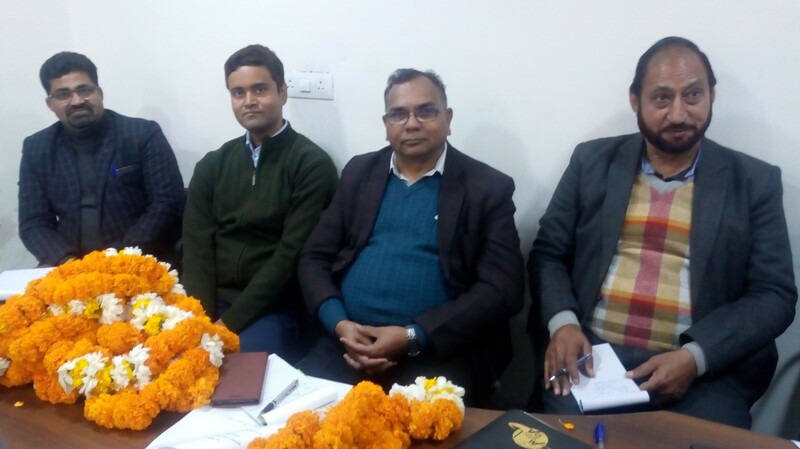 AUAB representatives in the Committee for Periodic Interaction, Com.P.Abhimanyu, GS, BSNLEU & Convenor, AUAB, Com.Chandeshwar Singh, CS, NFTE & Chairman, AUAB, Com.Prahlad Rai, GS, AIBSNLEA, and Com.K.Sebastin, GS, SNEA participated. From the DoT side, Shri R.K. Khandelwal, Joint Secretary(Admn.) Shri S.K. Jain, DDG (Estt. 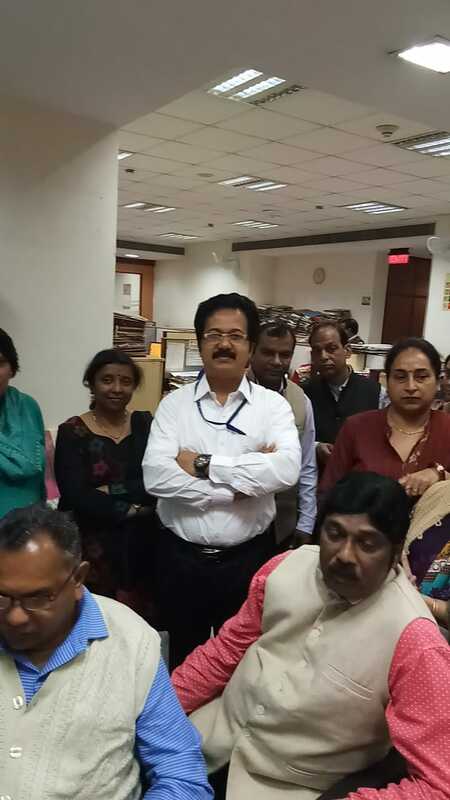 ), Shri Rajeev Kumar, DDG (Budget), also participated. Ms. Sujata T. Ray, Director (HR) and Shri A.M. Gupta, GM(SR), represented BSNL. Detailed discussion took place on the 3rd Pay Revision, 4G spectrum, Payment of Pension Contribution on actual basic pay and Pension Revision issues. As regards the 3rd Pay Revision issue, it was suggested from the DoT side that, Pay Revision with 5% fitment could be given. If the AUAB accepted this, then this issue would be placed for the approval of the Digital Commission meeting, to be held on 05/02/2019, and that thereafter it would go for the approval of the Cabinet, said the DoT side. The AUAB stated that 5% fitment is very low and that they could not accept it. Thereafter, the AST suggested that the AUAB representatives could discuss the issue with the CMD BSNL and could come back to him within a day or two. (b) Representation received from Shri Sanatan Ojha, SDE Staff No 107678 HR No. 99210932 working in TRAI as Senior Research Officer, Regional Officer, Jaipur, on deputation for posting in BSNL CO New Delhi. (c) Representation received from Shri Y.S. Eranna, AGM HR No. 198007732 regarding Postponement of his VR date. (a) DE to DGM (Engg) Promotion: We expressed our serious concern against non filling up the vacant 891 DGM (Engg) Posts even the CPC has been completed 28 days before but pending for approval from the Competent authority. CMD assured to discuss the matter with Dir (HR) for an early decision. (b) Pension Revision Formula for the BSNL Retirees: We requested CMD BSNL the Pension Revision Formula being proposed by the AUAB may kindly be approved in the Management Committee. CMD assured to consider the matter in case the Pension Revision Formula proposal submitted to the BSNL Management by the AUAB, it will be placed in the Management Committee for approval and will be sent DOT for consideration. (a) DE to DGM Promotion: We expressed our serious concern against the delay in issuing DE to DGM promotion orders since the CPC to fill up 891 vacant DGM Posts has been completed 28 days before. We requested PGM (Pers) to issue Promotion orders from DE to DGM (Engg) immediately. After detail discussions PGM (Pers) mentioned that the DE's seniority list will be placed in the public domain shortly and thereafter the promotion orders will be issued. (b) AO to CAO Promotion: We requested to fill up the vacant CAO Posts. PGM (Pers) mentioned that ASG opinion on own merit reservation issue is still awaited. However, he mentioned that Review CPC for SC/ST left out candidates is under process. We requested to utilize 336 MT quota CAO posts also for promoting remaining eligible AOs waiting for CAO Promotion on Adhoc basis. PGM (Pers) assured to look into the matter. (c) Promotion from JTO to SDE(T) : We requested to expedite CPC to fill- up vacant SDE(T) Posts (about 4900) since the contempt case in the Hon'ble CAT Ernakulam bench has been stayed. PGM (Pers) mentioned that senior officers are unhappy due to the contempt of court cases being filed by some individuals against promotions and has now directed not to consider any promotion till the time court cases are settled. 29.01.2019: Selection for the post of CMD BSNL: PESB in its meeting held at 10.00 AM on 29.01.2019 [Today] recommended the name of Sh. Pravin Kumar Purwar, CMD MTNL for the post of CMD BSNL. (6) a) Approval for BSNL's Land Management Policy without any delay. b) Expeditiously complete the mutation and the process of transferring of all assets to BSNL, as per the Cabinet decision taken on the eve of the formation of BSNL. (7) Extend financial support to BSNL, to ensure financial viability, as per the decision taken by the Group of Ministers, at the time of formation of BSNL. Issue letter of comfort for BSNL's proposals for taking bank loans. 25.01.2019: AUAB Meeting with Addl. Secretary (T), DoT on 30th Jan., 2019 at 12.00 Hrs: Director(HR), BSNL Board informed that Addl. Secretary(T), DoT has fixed up the Committee Meeting to discuss the demands of AUAB on 30th Jan., 2019 at 12.00 Hrs. 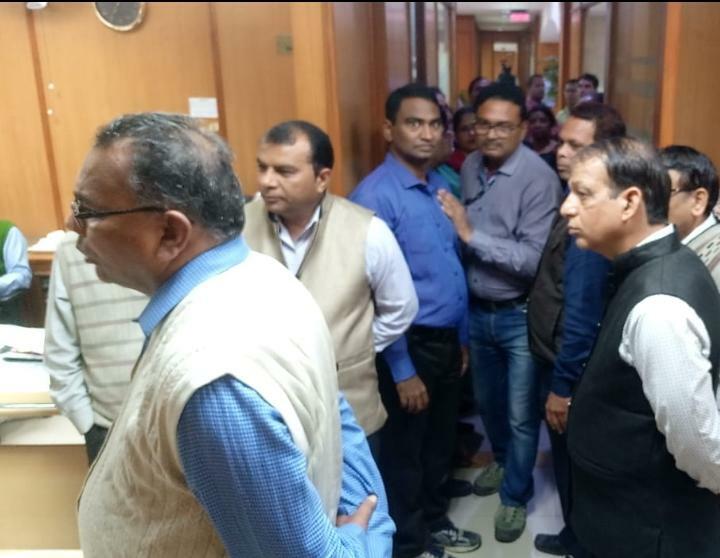 25.01.2019: HR Integration of Finance Wing of BSNL Corporate Office, New Delhi with Personnel Wing: Against the indifferent attitude of Sr. GM(FP) towards finance wing executives. AIBSNLEA strongly protested on 19th Nov., 2018 outside Sr.GM(FP) Office (Details also given below). Sr. GM(FP) was intentionally delaying issuance of AO to CAO Promotion on one pretext or the other. AIBSNLEA brought the kind intervention of CMD BSNL & Director(HR), BSNL Board in this regard, therefore only the AO to CAO promotion orders were issued on 20th Nov., 2018. Thus AIBSNLEA strongly demanded immediate HR integration wherein DGM(SEA) should report to GM(Pers.). Finally, the competent authority order for HR Integration on dated 24.01.2019<<<Click here for letter>>>. 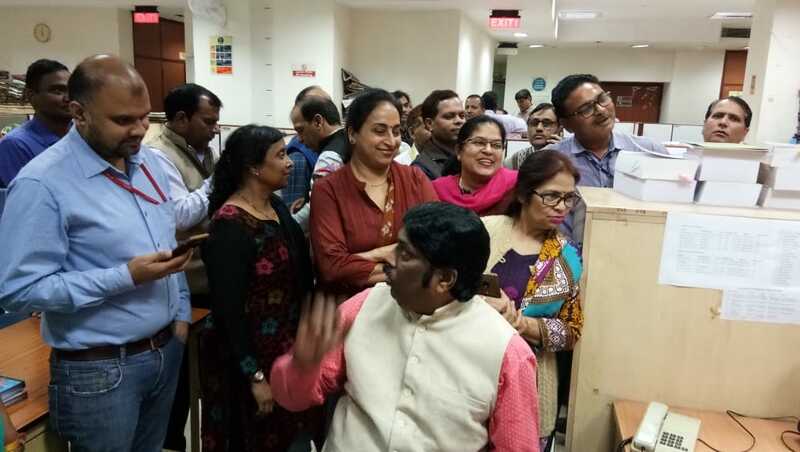 We are thankful to CMD BSNL, Director(HR) BSNL Board for taking the long awaited HR Integration decision in BSNL Corporate Office, New Delhi. AIBSNLEA BSNL Corporate Office, New Delhi executives assembled in the office of Sr. GM(FP), Director(HR), BSNL Board, CMD BSNL Offices to express their serious concern against not issuing AO to CAO promotions, JTO(T) to SDE(T) promotions & consideration of all the proposals of upgradation in all disciplines. Sr. GM(FP) was reluctant to meet & discuss the matter. Then GS, President along with other office bearers met Director(HR) and expressed the concern on the above issues. 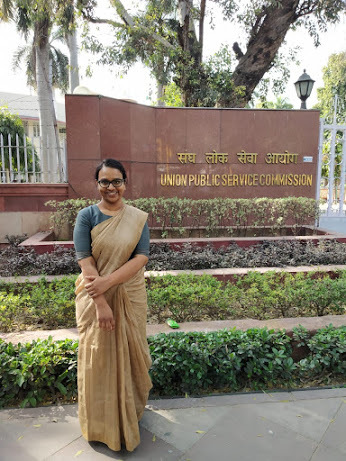 Director(HR) mentioned that she has already directed Sr.GM(FP) to process the case of AO to CAO promotions in the line of 2nd legal opinion issued from Sr. Advocate for promotions and advised to meet Sr.GM(FP) & CMD BSNL for further necessary action. Thereafter when Sr. GM(FP) did not met and discussed the matter, AIBSNLEA representatives met CMD BSNL & apprised the developments wherein some officers of BSNL Corporate Office are stopping the promotions. CMD BSNL after detailed discussions assured to discuss the matter with Director(HR) for issuing AO to CAO promotions against vacant posts. CMD further informed that 3 days before he has already cleared 17 nos. CAO to DGM(Fin.) promotion orders. We extended thanks to clearing CAO to DGM(Fin.) promotions. We requested to fill up 5000 vacant SDE(T) posts. CMD mentioned that let the contempt case in Hon'ble CAT Kerala be decided ,promotion orders from JTO(T) to SDE(T) will be issued. We further requested to consider upgradation of the posts in the next higher grade to the eligible executives for promotions in all the disciplines. CMD BSNL assured that let the existing vacancies in CAO cadre & SDE(T) cadre be first fill up thereafter immediately upgradation proposals will be considered. (b) DE to DGM (T) Promotion: We expressed our serious concern against non filling up the vacant 891 DGM (Engg) Posts even the CPC has been completed 20 days before but pending for approval from the competent authority. We apprised him about the status of the court judgments of TES Group 'B' seniority. CMD assured to discuss the matter with Dir (HR) for an early decision. (a) DE to DGM (Engg) Promotion: We expressed our concern against the delay in issuing DE to DGM promotion orders since the CPC has been completed 20 days before ,We also explained the status of court cases and Judgments on TES Group 'B' seniority. After detail discussions Dir(HR) mentioned that the DE'S seniority list will be placed in the public domain shortly and thereafter the promotion orders will be issued. (b)AUAB meeting with AST, DOT : Director (HR) mentioned that regarding committee meeting she contacted AST office today but AST was on tour. However tomorrow morning she will again talk to AST for fixing AUAB meeting to discuss their demands. (b) AO to CAO Promotion: We requested to fill up the vacant CAO Posts. Director (HR) mentioned that ASG opinion on the on merit reservation issue is still awaited. However, she mentioned that Review CPC for SC/ST left out candidates is being held shortly. (a) Promotion from JTO to SDE(T) : We requested to expedite CPC to fill- up vacant SDE(T) Posts (about 4900) since the contempt case in the Hon'ble CAT Ernakulam bench has been stayed. PGM(Pers) assured to look into the matter. (b) DE to DGM Promotion: We requested to PGM (Pers) to issue Promotion orders from DE to DGM (Engg) since the CPC to fill up 891 vacant DGM Posts has been completed but held up due to some objections raised in DE'S seniority list. PGM (Pers) assured to look into the matter and to issue promotion orders at the earliest. Souvenir broachers were sent to Circle Secretaries. If any Circle has not received / not sufficient, they may please call the Circle Secretary AP Circle Com. A. Koteswara Rao 9440000505/ Souvenir Committee Secretary Com. Narendar 9490206786. As per the decision taken in the AUAB meeting held yesterday, representatives of the AUAB, viz., Com. Com.P.Abhimanyu, GS, BSNLEU & Convener, Com.Chandeshwar Singh, GS, NFTE & Chairman, Com. Prahlad Rai, GS, AIBSNLEA and Com. K. Sebastin, GS, SNEA met Shri Anshu Prakash, Addl. Secretary(T), DoT , today. The representatives conveyed him the decision of the AUAB meeting held yesterday. They told the Addl. Secretary(T), in no uncertain terms that, the employees are unhappy that not much progress is made in the 3rd Pay Revision issue. They also informed him that the AUAB will be compelled to give call for the strike, since not much time is left for the Parliament elections. The Addl. Secretary(T) informed that he would hold a meeting with the AUAB next week in which crucial discussion would be held in respect of the issue of 3rd Pay Revision. During discussions, CMD BSNL was also present in the meeting. A meeting of the AUAB was held yesterday. Com.Chandeshwar Singh, GS, NFTE & Chairman, AUAB, presided over the meeting. Com.P.Abhimanyu, GS, BSNLEU & Convener, AUAB, welcomed everyone and presented the agenda item to be discussed in the meeting. General Secretaries / Representatives of BSNLEU, NFTE, SNEA, AIBSNLEA, AIGETOA, BSNL MS and BSNL OA, were present in the meeting. The meeting reviewed the progress in the settlement of the demands of the AUAB. The meeting assessed that reasonable progress is made on the demands of 4G spectrum and payment of pension contribution on actual basic pay. However, the meeting came to the conclusion that, no substantial progress has come on the issues of 3rd Pay Revision and Pension Revision. The meeting also came to the assessment that the time available for the settlement of demands is only upto February, 2019 and that the announcement for Parliament elections may come any time in March, 2019. Once the elections are announced, the Code of Discipline will also come into effect and no demand could be settled thereafter. In view of the above reasons, the meeting decided to convey to the government that, the AUAB would be compelled to give call for the strike. The meeting also decided that the AUAB should meet the Additional Secretary, Telecom, in person, and communicate this. GS AIBSNLEA and Advisor(N), CHQ Com. Karan Singh were present in the meeting. As per the decision taken in meeting held yesterday, letter has been written to Shri Manoj Sinha, Hon'ble Minister of State for Communications, by the AUAB, communicating it's unhappiness over the delay in the settlement of the 3rd Pay Revision issues. In the letter, the AUAB has stated that it would be compelled to go on strike, if no positive outcome comes on the issue. The letter was delivered by hand to the Private Secretary to the Hon'ble Minister of State for Communications today, by the AUAB representatives. 16.01.2019: Meeting between CMD BSNL and the AUAB on 3rd Pay Revision issue: In the meeting held on 10.01.2019, the Addl. 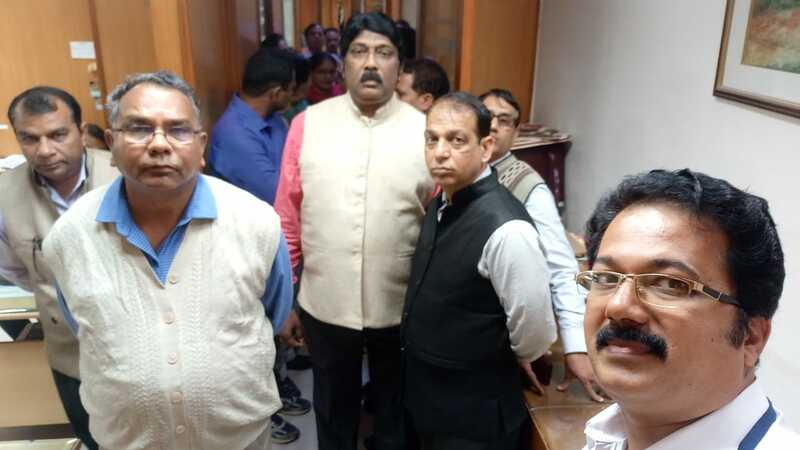 Secretary, Telecom, directed the AUAB to hold a discussion with the BSNL Management on the 3rd Pay Revision issue, and to come back to him for a meeting in the following week. Accordingly, a meeting took place between the AUAB and the CMD BSNL today. The Director (HR) was also present in the meeting. From the AUAB, Com.P. Abhimanyu, GS, BSNLEU & Convenor, Com. Chandeshwar Singh, GS, NFTE & Chairman, Com.K.Sebastin, GS, SNEA, Com. Prahlad Rai, GS, AIBSNLEA, Com.RaviShil Verma, GS, AIGETOA, Com. Suresh Kumar, GS, BSNL MS, Com. Rewati Prasad, AGS, ATM and Com. H.P. Singh, Dy.GS, BSNL OA, were present. Discussion took place on the issue of 3rd Pay Revision. The AUAB representatives categorically demanded that 3rd Pay Revision should be settled with 15% fitment. The CMD BSNL also stated that the BSNL Management sticks on to it's earlier position that 3rd Pay Revision should be settled with 15% fitment. The AUAB pointed out that the notification for Parliament election would be issued any time in the month of March, 2019 and that the available time for the settlement of 3rd Pay Revision was very less. The representatives also pointed out that the AUAB would be constrained to restart the agitation, if no favourable settlement comes on time. (a)Cancellation of transfer order of Shri Thulasi Ramaiah HJ (DGM (F) KTK. A meeting of the Committee for Periodic Interaction (Institutional Mechanism) was held in the Sanchar Bhawan yesterday the 10-01-2019. 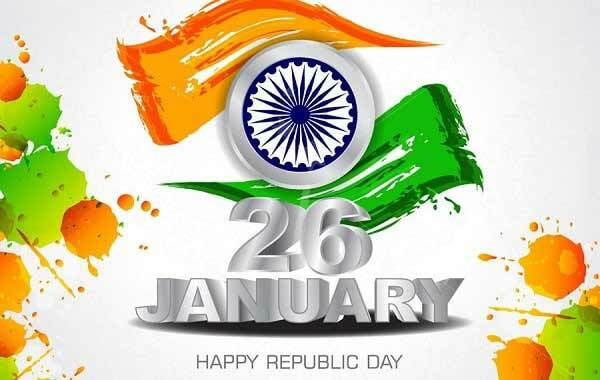 From the AUAB, Com.P.Abhimanyu, GS, BSNLEU & Convener, Com. Chandeswar Singh, GS, NFTE & Chairman, Com.K.Sebastin, GS, SNEA and Com.Prahlad Rai, GS, AIBSNLEA participated. Shri.R.K.Kandelwal, Joint Secretary(Admn.) - Convener Committee, Shri S.K.Jain, DDG(Estt. ), Sh. Rajeev Kumar DDG(Budget), Sh. Sanjay Agarwal, Director(Estt. ), Sh. Pawan Gupta, Director(PSU), from DoT side and Ms.Sujata Ray, Director(HR) and ShriA.M.Gupta, GM(SR) from BSNL side were present in the meeting. It may be remembered that the AUAB strongly demanded that this Committee should be chaired by the Addl. Secretary(T), and that no result would be achieved if it is presided over by the Joint Secretary level officer. Whatever we predicted, has proved to be correct. The Joint Secretary(Admn.) and the DDG(Estt.) were not able to give any worthwhile information about the status of the issues, viz., 3rd Pay Revision, Allotment of 4G spectrum, Payment of Pension Contribution on actual basic pay and Pension Revision. Both the officers are completely negative on our issues. No worth mentioning outcome came from this meeting. Hence, after this meeting, the AUAB leaders went and met Shri Anshu Prakash, Addl. Secretary(T) and expressed their total dissatisfaction about the outcome of the meeting. Shri R.K.Kandelwal, Joint Secretary (Admn. ), Ms. Sujata Ray, Director (HR) and Shri A.M.Gupta, GM(SR) were also present. Thereafter, full fledged discussion took place with the Addl.Secretary(T). 3rd Pay Revision : Detailed discussion took place. The Addl. Secretary(T) told that the DoT is ready to settle the 3rd Pay Revision. But, he categorically told that it will be very difficult for the DoT to get the approval of the Cabinet for 15% fitment, since BSNL's financial position does not allow payment of such high salary. He requested the AUAB and the BSNL Management to discuss and take viable decision and bring to DoT immediately so that this can be taken in next Digital Commission scheduled to be held in the first week of Feb., 2019. 4G spectrum to BSNL: As regards the allotment of 4G spectrum to BSNL, the Addl. Secretary(T) confidently told that the DoT would do it's best to get the Cabinet approval for the allotment of 4G spectrum to BSNL. He expressed hope that the Digital Commission meeting to be held in the 1st week of February would give the necessary clearance, after which it would go for the Cabinet approval. (a) Representation received from Shri Jagdish Chandra Chauhan, DGM (F), regarding promotion of Jt. GM (F) by granting relaxation in condition of recruitment rules. (b) Representation received from Shri Satish Kumar JAO, HR No. 00701635 regarding pay fixation in E1 scale (Rs. 18850/-) as Junior Accounts officer (JAO) promoted through JAO LICE exam held on 17.7.2016 under 40% quota. (d) Representation received from Shri Satish Kumar Gupta, HR No. 198809313 regarding promotion of CAOs and not joining as CAOs due to status quo grated by Hon'ble CAT Chandigarh. 10.01.2019: Report of the 5th Circle Conference of AIBSNLEA MP Circle held at Ujjain on 4.1.2019 : The “Open Session” of 5th Circle Conference of AIBSNLEA MP Circle was held at Hotel Meghdoot & Resort, Indore Road Ujjain on 4th January 2019.The open session was inaugurated by lightning the lamp by CGMT M.P. Circle Dr.Mahesh Shukla, CHQ President Shri S.Sivakumar,GS Shri.Prahlad Rai, Organizing Secretary (West) CHQ Shri.C.M.Saste. The hall was jam packed and was full to its capacity. The welcome speech was presented by Chairman Organizing Committee Shri.P.K.Shukla., he welcomes all the guests and members present in the house. Circle Secretary M.P Circle read the Key Note address and underlines the important issues at CHQ level as well as circle level. Leaders of All Unions & Associations were attended and addressed the Open Session. Dr.Mahesh Shukla CGM M.P. Circle BSNL addressed the house. In his address CGM Dr.Mahesh Shukla underline the various issues related to BSNL viability. He also put forward his personnel view of “Volunteer Replacement Scheme “in which employees & Officers above 50 years of age may replace them with their wards. In his opinion this will save the expenditure on salary and at the other hand manpower problem of BSNL can be solved and BSNL will get young and energetic manpower. Shri.Habib Khan Chairman AUAB M.P & CS NFTE, DS AIGETOA Ujjain, Shri.R.K.Raikwar CS SEWA M.P Shri.Dutta Majumdar CS SNEA, Shri.Prakash Sharma Convener AUAB M.P & CS BSNLEU M.P addressed the gathering. OS(West) Com. C,M Saste in his address thanked the MP Circle for conducting the Circle Conference which was over due. He assured MP circle all the co-operation from CHQ. CHQ President Com.S.Sivakumar in his energetic and impressive speech informed the house regarding all the issues related to Viability of BSNL, Promotions in various cadres, Court cases and AIBSNLEA's role in various agitation programmers. The gathering was very curious to listen their beloved leader Com.Prahlad Rai GS, AIBSNLEA .In a very impressive & commanding Speech GS covered all the issues from viability of BSNL to the organizational matters. GS informed in response to DOT letter dated 6-11.2018, that BSNL Management has proposed reduction of retirement age as 58 years Instead of 60 years for revision of pay of Board level and below Board level executives of BSNL under 3rd PRC. Even this BSNL's proposal is not acceptable to DoT, mentioning that the financial implication for Implementation of 3rd PRC i.e. Rs. 2980 Crore annually could not be substantiated. GS expressed his surprise that BSNL Management has given such proposal to DoT even without discussing with theBSNL Unions and Associations. This is a serious situation and our association with AUAB has to mmediately react against such Actions of DOT/BSNL Management. Regarding JTO (T) To SDE (T) our GS informed that AIBSNLEA is seriously taking up the case to fill up about 4700 vacant SDE (T) posts Since there is no stay order in promotions from JTO (T) to SDE (T).But you know that due to contempt of court Case is pending in Hon'ble CAT Ernakulam promotion order from JTO(T) to SDE(T) could not be issued. GS informed that AIBSNLEA is against recruitment of MT in BSNL,and CHQ is ready to fight against the direct recruitment of MT in BSNL, the prospects of BSNL recruits officers will be badly affected if this channel is open and once again Our young officers will face the same situation which we the seniors have faced due to recruitment of ADT's.Regarding DE To DGM Promotion GM informed that Hon'able CAT Chandigarh vacated the Stay order from DE to DGM (T) promotion. You Know that about 890DGM (T) posts is vacant and adhoc DGM and Regular DE's who had completed 4 years service may get the benefit. CHQ is seriously taking up the issue with Director HR & GM Pers. for early issue of promotion orders. Regarding AO To CO Promotion, Status quo case on catch up rule in Hon'ble CAT is posted for next Hearing on 29.1.2019. CHQ is making all efforts to get vacated Status-Quo in AO to CAO promotion order from Hon'ble Chandigarh CAT and had meeting with Director (HR) and GM (Pers.). Director (HR) directed GM (Pers.) to take immediate action to get vacates Status Quo order for AO to CAO Promotions. Regarding implementation of Rule -206 of SDE's Seniority Case, GS informed that due to continuous persuasion of CHQ, Director (HR) given the approval to take the legal opinion from ASG for the implementation of Rule-206 of TES Group-'B' seniority case judgment delivered by the Hon'ble Supreme Court.The draft proposal for seeking legal opinion from ASG is being sent shortly. The Hon'ble SC Judgment on Rule-206 TES Group-'B' officer's seniority case in true sense. 1. Payment of pension contribution on actual basic pay instead of maximum of the pay scale: AIBSNLEA is perusing the matter and took meeting with Adl.Sect (T) ,as you know a committee comprising DOT/BSNL officers and AUAB representatives was constituted. AIBSNLEA expressed its concern against Non inclusion of the Executive Associations in the Committee and not holding of the Committee meeting. 2. Delinking of pension revision from pay revision of BSNL employees: AIBSNLEA took the issue with Adl.Secy (T) and it was informed that due to not receipt of reply from Jt.Secy.DOP & PW the issue is pending, an early reply of DOT letter by DOP & PW may resolve the issue. submitted inDOT in First week of January. On the basis of IIM Ahmadabad report Cabinet Note will be moved to Cabinet for the Implementation of 3rd PRC. 4. 4G Spectrum to BSNL: DOT is trying to resolve the issue from DOE .No concrete solution is visible. 5. Revision of pay scales E1A by E2, E2A by E3, E3 by E4, E4 by E5, E5 by E6 & E6 by E7: AIBSNLEA CHQ gave letter to Adl.Secy . (T) in this regard, It is now with Jt. Secy(Admin), The delay in settlement of AUAB demands is causing resentment & frustration among the BSNL employees. To avoid Resumption of Indefinite Strike by AUAB, the demands should immediately be settled by DOT as Assured by the Hon'ble MOSC & Secy. (T), DOT. Regarding Promotion of JAO to AO, JTO TO SDE, SDE TO DE, Telecom Factory, Electrical & Civil Wing : GS mentioned that due to efforts of AIBSNLEA the history was created and all pending promotions of JAO to AO, JTO TO SDE, SDE TO DE, Telecom Factory, and Electrical & Civil Wing were issued. GS appreciated Ujjain Comds. for making fabulous arrangements of 5th Circle Conference. GS gave thanks to gathering for patient listening and due to shortage of time could not cover many other issues. GS then proposed to have elections of new body, which was accepted by the house. Shri.H.M. Bajpai, President AIBSNLEA M.P dissolved the present body Shri.P.K.Shukla DS Ujjain proposed the name of Shri.H.M.Bajpai as election officer, house passed the proposal. Oath taking ceremony to new elected body was performed by AIC President Shri.S.Sivkumar.